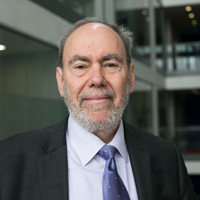 Professor Stanton Newman, Dean of the School of Health Sciences until 2017, joined City University London in September 2010. He is Professor of Health Psychology and completed his B.Soc. Sci. (Hons) degree and doctorate at the University of Natal, South Africa. Professor Newman became a lecturer at LSE and Guys and Middlesex Hospital Medical Schools before joining University of College London. Professor Newman was Head of the Department of Psychiatry and Behavioural Science from 1993 - 2004. In 2003 he set up the Centre for Behavioural and Social Science in Medicine, a unique project to encourage interdisciplinary working in physical illnesses at UCL. He attended the London Business School and ran UCL Consultants Ltd. In 2009 Professor Newman was appointed the Principal Investigator on the Whole Systems Demonstrator Project funded by the Department of Health to evaluate the role of assistive technologies in health and social care. Clinical Health Psychologist working with patients at University College Hospital and at King Edward VII's Hospital. Clinic held one afternoon a week. 1. Telehealth for chronic conditions - COPD, Heart failure, and Diabetes. European Fund has been awarded for a grant to assess and implement telehealth in a number of European Countries (total € 1.6 mil). 2. Telecare of the frail elderly and those using social care. 5 papers in preparation and 1 systematic review of caregivers accepted for publication. a. A large study underway in Grown up Congenital Heart Disease supported by grants and two Phd studentships. This is the largest study in the world on this topic and 2 publications have been submitted on this work. b. A grant has been obtained to conduct a study on providing diabetic patients with information on genetic and modifiable risk and the use of a self management programme to avoid progression to coronary artery disease. c. Juvenile Arthritis has been a focus of Professor Newman's work for the last 6 years supported by 2 programme grants. Most recently this work has evolved into changing how care is managed by the development of website to support parents and add to the care being received. d. Rheumatoid Arthritis has been supported by two grants where the focus is on the outcome of a randomised controlled trial to assess an intervention that trains patients to self manage their medication by reading their own blood results. e. Systemic Lupus Arythemetosus has been the subject of previous work and the focus of the current work is on the impact of uncertainty and patients' ability to manage their condition. This has been supported by a research grant and a Phd student and has resulted in 1 publication to date with 3 further publications planned in the short term as the results materialise. f. Disfiguring Conditions Following on a grant funded large study Professor Newman has focussed on disfigurement in arthritis and ocular prostheses. Both have been the subject of publications. g. Eye diseases and treatment. Professor Newman has a good collaborative arrangement with Moorfields Eye Hospital where his research group is conducting research on the impact of treatment on patients and the relationship of patients' responses to the judgement of the surgeons and other health care professionals. The first area is the impact of surgery for strabismus and the second is the impact of surgery for Thyroid Eye Disease. This work has been supported by a grant a visiting research fellow and a Phd studentship. h. Self Management in renal dialysis is the subject of a large funded study running in Singapore. a. The Xtreme Everest Study that was designed to assess the impact of hypoxia on the brain and other organs. This study was grant funded and involved assessing approximately 200 trekkers at 5 altitude points and on their return to sea level as well as 8 summiteers. The analysis and write up of this work continues with collaborators and a Phd student. b. The PQRS has involved the development of a tool to assess recovery from surgery and anaesthesia that has been supported through donations and grants. It has resulted in high impact publications and continues to attract funding. c. End Stage Renal disease treatments have and continue to be a focus of work with a key collaborator (previously Phd student). This work has demonstrated the impact of different forms of dialysis as well transplantation on the brain. Recent high impact publications have demonstrated that cognitive performance is an independent predictor of mortality in these groups. d. Impact of surgery on the brain work is continuing but at a lower level from previous years where the earlier work was ground breaking in relation to microemboli and surgical and anaesthetic techniques to reduce brain damage following routine cardiac surgery. Studies have been performed on knee surgery and different forms of anaesthesia. Ayers, S., Baum, A., McManus, C., Newman, S., Wallston, K., Weinman, J. … West, R. (2014). Cambridge handbook of psychology, health and medicine, second edition. ISBN 978-0-511-54357-9. Ayers, S., Baum, A., McManus, C., Newman, S., Wallston, K., Weinman, J. … West, R. (2014). Preface. ISBN 978-0-511-54357-9. Newman, S.P., Steed, E. and Mulligan, K. (2009). Chronic physical illness. Newman, S.P., Steed, E. and Mulligan, K. (Eds. ), London: Open University Press. ISBN 978-0-335-21786-1. Ayers, S., Baum, A., McManus, C., Newman, S., Wallston, K., Weinman, J. … West, R. (2007). Cambridge Handbook of Psychology, Health and Medicine Second edition Preface. CAMBRIDGE UNIV PRESS. Ayers, S., Baum, A., McManus, C., Newman, S.P., Wallston, K., Weinman, J. … West, R. (Eds. ), (2006). Cambridge Handbook of Psychology, Health And Medicine. Cambridge University Press. ISBN 978-0-521-60510-6. Newman, S.P., Harrison, M.J.G. and Stump, D.A. (1999). The brain and cardiac surgery. Newmans, S.P., Harrison, M.J.G. and Stump, D.A. (Eds. ), London: Harwood Press. ISBN 978-90-5702-476-4. Baum, A., Newman, S.P., Weinman, J., West, R. and McManus, C. (Eds. ), (1997). Cambridge Handbook of Psychology, Health and Medicine. Cambridge, UK: Cambridge University Press. ISBN 978-0-521-43686-1. Newman, S.P. and Lonsdale, S. (1996). Human jungle. London: Ebury Press. ISBN 978-0-09-181389-5. Newman, S.P., Fitzpatrick, R., Revenson, T., Skevington, S. and Williams, G. (1995). Understanding Rheumatoid Arthritis. London: Routledge. ISBN 978-0-415-10540-8. Scambler, A. and Scambler, G. (1993). Menstrual disorders. Newman, S.P. (Ed. ), London: Routledge. ISBN 978-0-415-04646-6. Beck, E., Lonsdale, S., Newman, S.P. and Patterson, D. (Eds. ), (1992). In the best of health? : The status and future of the NHS. London: Chapman and Hall. ISBN 978-0-412-38710-4. Kelly, M.P. (1992). Colitis. Newman, S.P. (Ed. ), London: Routledge. ISBN 978-0-415-03839-3. Beck, E.R., Lonsdale, S., Patterson, D. and Newman, S. (1992). In the Best of Health? Beck, E., Lonsdale, S., Patterson, D. and Newman, S. (Eds. ), Chapman Hall. ISBN 978-0-412-38710-4. Fallowfield, L. and Clark, A. (1991). Breast cancer. Newman, S.P. (Ed. ), London: Routledge. ISBN 978-0-415-03841-6. Scambler, G. (1989). Epilepsy. Newman, S.P. (Ed. ), London: Routledge. ISBN 978-0-415-01757-2. Humphrey, M. (1989). Back Pain. Newman, S.P. (Ed. ), Routledge. ISBN 978-0-415-01720-6. Robinson, I. (1988). Multiple Sclerosis. Newman, S.P. (Ed. ), London: Routledge. ISBN 978-0-203-97783-5. Kelleher, D. (1988). Diabetes. London: Routledge. ISBN 978-0-415-00726-9. Newman, S.P. and Epstein, R. (Eds. ), (1985). Current perspectives in dysphasia. Edinburgh: Churchill Livingstone. ISBN 978-0-443-03039-0. Geber, B.A. and Newman, S.P. (1980). Soweto's children. London: Academic Press. Hyde, M., Higgs, P. and Newman, S.P. (2009). The health profile of ageing populations. In Newman, S.P., Steed, E. and Mulligan, K. (Eds. ), Chronic physical illness: Self-management and behavioural interventions (pp. 4–27). London: Open University Press. ISBN 978-0-335-21786-1. Mulligan, K., Steed, L. and Newman, S.P. (2009). Different types and components of self-management interventions. In Newman, S.P., Steed, E. and Mulligan, K. (Eds. ), Chronic physical illness: Self-management and behavioural interventions (pp. 64–77). London: Open University Press. ISBN 978-0-335-21786-1. Cooke, D., Patel, S. and Newman, S.P. (2009). Facilitating self-management through telemedicine and interactive health communication applications. In Newman, S.P., Steed, E. and Mulligan, K. (Eds. ), Chronic physical illness (pp. 120–131). Open University Press. ISBN 978-0-335-21786-1. Steed, L., Mulligan, K. and Newman, S.P. (2009). Development and evaluation of self-management interventions. In Newman, S.P., Steed, E. and Mulligan, K. (Eds. ), Chronic physical illness: Self-management and behavioural interventions (pp. 135–147). London: Open University Pres. ISBN 978-0-335-21786-1. Newman, S.P. and Cooke, D. (2009). Conclusion. In Newman, S.P., Steed, E. and Mulligan, K. (Eds. ), Chronic Physical Illness: Self-management and behavioural interventions (pp. 289–297). London: Open University Press. ISBN 978-0-335-21786-1. Newman, S.P., Hirani, S.P., Stygall, J. and Fteropoulli, T. (2009). Treatment in Cardiovascular Disease. In Baum, A. (Ed. ), Handbook of Health Psychology London: Taylor and Francis. ISBN 978-0-8058-6461-8. Newman, S.P. and Griva, K. (2007). Quality of life in end-stage renal disease and treatments. In Anagnostopoulos, F. and Karademas, E. (Eds. ), Special issues in health psychology: a Greek perspective (pp. 97–30). Athens: Livani Publishing. Mulligan, K. and Newman, S. (2007). Self-management interventions. (pp. 393–397). CAMBRIDGE UNIV PRESS. Stygall, J. and Newman, S. (2007). Carotid artery disease and treatment. (pp. 613–615). CAMBRIDGE UNIV PRESS. Stygall, J. and Newman, S. (2007). Hospital acquired infection. (pp. 736–738). CAMBRIDGE UNIV PRESS. Mulligan, K. and Newman, S. (2007). Coronary heart disease: heart failure. (pp. 654–656). CAMBRIDGE UNIV PRESS. Charlesworth, G. and Newman, S.P. (2006). Clinical trials for psychosocial interventions aimed at caregivers of people with dementia. In Rockwood, K. and Gauthier, S. (Eds. ), Trial designs and outcomes in dementia therapeutic research Abingdon, UK: Taylor and Francis. ISBN 978-1-84184-321-6. Newman, S.P. (2006). Self management. In Ayers, S., Baum, A. and McManus, C. (Eds. ), Cambridge Handbook of Psychology, Health and Medicine Cambridge, UK: Cambridge University Press. ISBN 978-0-521-87997-2. Newman, S.P. (2006). Carotid artery stenosis and endarterectomy. In Ayers, S., Baum, A. and McManus, C. (Eds. ), Cambridge Handbook of Psychology, Health and Medicine Cambridge, UK: Cambridge University Press. ISBN 978-0-521-87997-2. Newman, S.P. (2006). Coronary heart disease: surgery. In Ayers, S., Baum, A. and McManus, C. (Eds. ), Cambridge Handbook of Psychology, Health and Medicine Cambridge, UK: Cambridge University Press. ISBN 978-0-521-87997-2. Newman, S.P. (2006). Rheumatoid arthritis. In Ayers, S., Baum, A. and McManus, C. (Eds. ), Cambridge Handbook of Psychology, Health and Medicine Cambridge, UK: Cambridge University Press. ISBN 978-0-521-87997-2. Newman, S.P. (2006). Transplantation. In Ayers, S., Baum, A. and McManus, C. (Eds. ), Cambridge Handbook of Psychology, Health and Medicine Cambridge, UK: Cambridge University Press. ISBN 978-0-521-87997-2. Newman, S.P. and Mulligan, K. (2004). Psychological aspects of rheumatic disease. In Isenberg, D.A. and Isenberg, D. (Eds. ), Oxford textbook of rheumatology Oxford University Press. ISBN 978-0-19-850948-6. Myers, L.B., Newman, S.P. and Enomoto, K. (2004). Coping. In Kaptein, A.A. and Weinman, J. (Eds. ), Health psychology (pp. 141–157). Wiley-Blackwell. ISBN 978-0-631-21442-7. Newman, S.P. (2004). Writing Grant Applications. In Michie, S. and Abraham, C. (Eds. ), Health Psychology in Practice (pp. 180–189). Wiley-Blackwell. ISBN 978-0-470-69321-6. Newman, S.P., Stygall, J. and Kong, R. (2001). Treatment of cardiovascular disease and neuropsychological performance: coronary artery bypass surgery. In Waldstein, S.R. and Elias, M.F. (Eds. ), Neuropsychology of cardiovascular disease New Jersey: Lawrence Erlbaum. ISBN 978-0-8058-3103-0. Newman, S.P., Stygall, J. and Kong, R. (2000). Neuropsychological consequences of coronary artery bypass surgery. In Waldstein, S.R., Elias, M.F. and Merrill, F.E. (Eds. ), Neuropsychology of cardiovascular disease Psychology Press. Newman, S.P. and Mulligan, K. (2000). The psychology of rheumatic disease. Bailliere's Clinical Rheumatology (pp. 773–786). London: Harcourt Publishers Ltd.
Harrington, J., Kirk, A. and Newman, S.P. (1999). Developmental issues in adolescence and the impact of rheumatic disease. In Isenberg, D.A. and Miller, J.J. (Eds. ), Adolescent rheumatology London: Martin Dunitz Ltd. ISBN 978-1-85317-553-4. Newman, S.P. (1998). Psychological aspects of rheumatic disease. In Maddison, P.J., Isenberg, D.A., Woo, P. and Glass, D.N. (Eds. ), Oxford textbook of rheumatology ISBN 978-0-19-262697-4. Newman, S.P. (1997). Transplantation. In Baum, A., Newman, S.P., Weinman, J., West, R. and McManus, C. (Eds. ), Cambridge Handbook of Psychology, Health and Medicine (pp. 612–612). London: Cambridge University Press. ISBN 978-0-521-43686-1. Newman, S.P. (1997). Rheumatoid Arthritis. In Baum, A., Newman, S.P., Weinman, J., West, R. and McManus, C. (Eds. ), Cambridge Handbook of Psychology, Health and Medicine (pp. 576–578). London: Cambridge University Press. ISBN 978-0-521-43686-1. Newman, S.P. (1997). Cardiac Surgery. In Baum, A., Newman, S.P., Weinman, J., West, R. and McManus, C. (Eds. ), Cambridge Handbook of Psychology, Health and Medicine (pp. 396–399). London: Cambridge University Press. ISBN 978-0-521-43686-1. Newman, S.P. (1997). Carotid stenosis and endarterectomy. In Baum, A., Newman, S.P., Weinman, J. and West, R. (Eds. ), Cambridge Handbook of Psychology, Health and Medicine (pp. 399–400). London: Cambridge University Press. ISBN 978-0-521-43686-1. Stump, D. and Newman, S.P. (1996). Embolus detection during cardiopulmonary bypass. In Tegeler, C.H., Babikian, V.L. and Gómez, C.R. (Eds. ), Neurosonology (pp. 252–258). St Louis: Mosby Inc.. ISBN 978-0-8151-8792-9. Newman, S.P. (1993). Neuropsychological and psychological consequences of Cardiac Surgery. In Smith, P.L. and Taylor, K.M. (Eds. ), Cardiac surgery and the brain London: Andrew Arnold. ISBN 978-0-340-55315-2. Rogers, A., Newman, S.P. and Stump, D. (1993). Neurologic effects of cardiopulmonary bypass. In Gravlee, G.P., Davis, R.F. and Utley, J.R. (Eds. ), Cardiopulmonary bypass:Principles and practices Baltimore: Lippincott Williams & Wilkins. Field, H., Newman, S.P. and Wright, S. (1993). Saccadic eye movements while reading and tracking in dyslexic, reading-matched and IQ-matched samples. In Ydewalle, G. and Rensbergen, J. (Eds. ), Perception and cognition (pp. 309–319). Amsterdam: Elsevier. ISBN 978-0-444-89938-5. Newman, S.P. (1993). Saccadic eye movements in dyslexics, low achievers, and competent readers. In Wright, S.F. and Groner, R. (Eds. ), Facets of dyslexia and its remediation Amsterdam: Elsevier Science Pubs. ISBN 978-0-444-89949-1. Newman, S.P. and Shipley, M. (1993). Psychological aspects of rheumatic diseases. In Newman, S.P. and Shipley, M. (Eds. ), Psychological aspects of rheumatic disease (Bailliere's Clinical Rheumatology) (pp. 215–219). Bailliere Tindall. ISBN 978-0-7020-1710-0. Newman, S.P. and Shipley, M. (1993). Psychological aspects of rheumatic diseases. In Newman, S.P. and Shipley, M. (Eds. ), Psychological aspects of rheumatic disease (pp. 215–219). London: Balliere-Tindall. ISBN 978-0-7020-1710-0. Newman, S.P. and Revenson, T. (1993). Coping with rheumatoid arthritis. In Newman, S.P. and Shipley, M. (Eds. ), Psychological aspects of rheumatic disease (pp. 259–280). London: Balliere-Tindall. ISBN 978-0-7020-1710-0. Newman, S.P. (1993). Cognitive changes in systemic lupus erythematosus. In Newman, S.P. and Shipley, M. (Eds. ), Psychological aspects of rheumatic disease (pp. 357–376). London: Balliere-Tindall. ISBN 978-0-7020-1710-0. Newman, S.P. (1992). Perceived and assessed cognitive function following coronary artery bypass surgery. In Walter, P.J. (Ed. ), Quality of life after open heart surgery Dordrecht: Kluwer. ISBN 978-0-7923-1580-3. Smith, P. and Newman, S.P. (1992). Cerebral damage before and after cardiac surgery. In Willner, A.E. (Ed. ), Cerebral damage before and after cardiac surgery Dordrecht: Kluwer Academic Pub. ISBN 978-0-7923-1928-3. Newman, S.P. and Durrance, P. (1991). The determinants and impact of programmes to reduce risk behaviour for HIV infection. In Johnston, M., Herbert, M. and Marteau, T. (Eds. ), European health psychology BPS. Newman, S.P., Klinger, L., Venn, G., Smith, P., Harrison, M. and Treasure, T. (1990). The persistence of neuropsychological deficits 12 months after coronary artery bypass surgery. In Willner, A.E. and Rodewald, G. (Eds. ), Impact of cardiac surgery on the quality of life New York: Plenum Press. ISBN 978-0-306-43689-5. Smith, P., Blauth, C., Newman, S.P., Arnold, J. and Siddons, F. (1990). Cerebral microembolism and neuropsychological outcome following coronary artery bypass surgery (CABS) with either a membrane or bubble oxygenator. In Willner, A.E. and Rodewald, G. (Eds. ), Impact of cardiac surgery on the quality of life New York: Plenum Press. ISBN 978-0-306-43689-5. Newman, S.P. (1990). Coping with chronic illness. In Bennett, P., Weinman, J. and Spurgeon, P. (Eds. ), Current developments in health psychology Amsterdam: Harwood Academic Press. ISBN 978-3-7186-5064-4. Treasure, T., Pugsley, W., Klinger, L., Paschalais, C., Aspey, B., Harrison, M. … Newman, S.P. (1990). Arterial line filtration reduces microembolism and significantly improves neuropsychological outcome in coronary artery surgery. In Willner, A.E. and Rodewald, G. (Eds. ), Impact of cardiac surgery on the quality of life New York: Plenum Press. ISBN 978-0-306-43689-5. Newman, S.P., Klinger, L., Venn, G., Smith, P., Harrison, M. and Treasure, T. (1990). Reports of cognitive change, mood state and assessed cognition following coronary artery bypass surgery. In Willner, A.E. and Rodewald, G. (Eds. ), Impact of cardiac surgery on the quality of life New York: Plenum Press. ISBN 978-0-306-43689-5. Newman, S.P., Fitzpatrick, R., Lamb, R. and Shipley, M. (1989). An analysis of patterns of coping in rheumatoid arthritis. In Schmidt, L.R. (Ed. ), Theoretical and applied aspects of health psychology London: Harwood Academic Press. ISBN 978-3-7186-5053-8. Newman, S.P., Karle, H., Wadsworth, J., Archer, R. and Hockly, R. (1987). A reassessment of ocular dominance and reading disability. In O'Regan, J.K. (Ed. ), Eye movements: from physiology to cognition Amsterdam: Elsevier Science Ltd. ISBN 978-0-444-70113-8. Hicks, B., Fenekos, K., Muhlhauser, I., Newman, S.P., Petrides, P., Pelser, H. … Thalassinos, N. (1987). Counselling on late complications. The teaching letter (pp. 49–52). Diabetes Education Study Group. Day, J., Felton, A., Fenekos, C., Kalbermatten, N., Newman, S.P., Nunes-Correa, J. … Theophanides, C. (1987). Continuing and reinforcing patient education. The teaching letter Diabetes Education Study Group. Harrison, M., Smith, P., Newman, S.P., Ell, P., Schneidau, A. and Treasure, T. (1987). Neurologic and neuropsychological sequalae of coronary artery bypass surgery. In Meyer, J.S. and Neurology, W.F.O. (Eds. ), Cerebral vascular disease 6 (pp. 55–59). Elsevier Science Pubs. ISBN 978-0-444-80875-2. Reddburn, J., Newman, S.P., Jameson, D.G. and Baldwin, A. (1986). A microcomputer based system for the analysis of saccadic movements. In O'Regan, J.K. (Ed. ), Eye Movements: from physiology to cognition Amsterdam: Elsevier Science Ltd. ISBN 978-0-444-70113-8. Smith, P., Joseph, P., Newman, S.P., Harrison, M., Treasure, T. and Ell, P. (1986). Intravenous Xe-133 cerebral blood flow studies in the assessment of the cerebral consequences of coronary artery bypass surgery. In Höfer, R., Internationales, S.G. and Gasteiner, I.-.S. (Eds. ), Radioaktive Isotope in Klinik und Forschung Wein: Verlag H Egermann. ISBN 978-3-900287-16-0. Newman, S.P. and Green, D. (1985). Bilingualism and dysphasia - process & resources. In Newman, S.P. and Epstein, R. (Eds. ), Current perspectives in dysphasia (pp. 155–181). Edinburgh: Churchill Livingstone. ISBN 978-0-443-03039-0. Newman, S.P. (1984). The psychological consequences of cerebrovascular accidents and head injury. In Fitzpatrick, R. (Ed. ), The experience of illness (pp. 179–200). London: Tavistock Press. ISBN 978-0-422-78530-3. Newman, S.P. (1984). Anxiety, surgery and hospitalisation. In Fitzpatrick, R. (Ed. ), The experience of illness (pp. 133–153). London: Tavistock Press. ISBN 978-0-422-78530-3. Newman, S.P. (1973). Language acquisition. In Blacquire, A. and Laboratories, S.A.R.C.F.L. (Eds. ), Language Laboratories in South Africa Pietermaritzburg, South Africa: University of Natal Press. ISBN 978-0-86980-035-5. Newman, S.P. and Fell, M. Psychological and psychiatric aspects of HIV. In Miller, A. (Ed. ), Medical management in HIV and AIDS (pp. 49–59). 1996: Springer Verlag. Griva, K., Nandakumar, M., Rajeswari, M., Khoo, E.Y., Leow, R., Lee, V.Y.W. … Newman, S.P. (2018). Associations between health literacy and healthcare utilization in patients with coexisting diabetes and end stage renal disease. Griva, K., Yoong, R.K.L., Nandakumar, M., Khoo, E., Rajeswari, M., Knag, A.W.C. … Newman, S.P. (2018). ASSOCIATIONS BETWEEN HEALTH LITERACY AND HEALTHCARE UTILIZATION IN PATIENTS WITH COEXISTING DIABETES AND END STAGE RENAL DISEASE. Griva, K., Lam, K.F.Y., Mooppil, N., Ng, H.J., Kang, W.C.A., McBain, H. … Newman, S.P. (2016). LONGITUDINAL TRAJECTORIES OF DEPRESSIVE AND ANXIOUS SYMPTOMS FOLLOWING A SELF-MANAGEMENT INTERVENTION FOR HAEMODIALYSIS PATIENTS. Lam, K.F., Mooppil, N., Ng, H.J., Kang, A.W., McBain, H., Newman, S. … Griva, K. (2016). Longitudinal Trajectories of Depressive and Anxious Symptoms Following a Self-Management Intervention for Haemodialysis Patients. Griva, K., Deane, J., Rixon, L., Shahab, L. and Newman, S.P. (2015). THE DIFFERENTIAL COURSE OF NEUROCOGNITIVE FUNCTIONING IN DIALYSIS AND TRANSPLANTATION - A SIX YEAR PROSPECTIVE STUDY. McBain, H., Shipley, M., Olaleye, A., Moore, S. and Newman, S.P. (2014). OP0086-HPR A Self-Monitoring and Patient-Initiated Follow-Up Service for Patients with Rheumatoid or Psoriatic Arthritis: A Randomized Controlled Trial. Cleanthous, S., Cano, S., Isenberg, D., Isenberg, D. and Newman, S. (2014). IS PATIENT UNCERTAINTY ASSOCIATED WITH OUTCOMES IN SYSTEMIC LUPUS ERYTHEMATOSUS? Cleanthous, S., Newman, S.P., Isenberg, D.A. and Cano, S.J. (2014). PATIENT CERTAINTY QUESTIONNAIRE: DEVELOPMENT AND VALIDATION OF A NEW OUTCOME MEASURE FOR PATIENTS WITH SYSTEMIC LUPUS ERYTHEMATOSUS AND RHEUMATOID ARTHRITIS. Natsiavas, P., Filos, D., Maramis, C., Chouvarda, I., Schonenberg, H., Pauws, S. … Consortium, A.C.T. (2014). A Computational Infrastructure for Evaluating Care-coordination and Telehealth Services in Europe. Griva, K., Mooppil, N., Krishnan, D.S.P., McBain, H. and Newman, S.P. (2013). SHORT AND LONG-TERM OUTCOMES OF THE HEMODIALYSIS SELF MANAGEMENT INTERVENTION RANDOMISED TRIAL (HED-SMART) - A PRACTICAL LOW INTENSITY INTERVENTION TO IMPROVE ADHERENCE AND CLINICAL MARKERS. 50th European-Renal-Association - European-Dialysis-and-Transplant-Association Congress 18-21 May, Istanbul, TURKEY. SHORT AND LONG-TERM OUTCOMES OF THE HEMODIALYSIS SELF MANAGEMENT INTERVENTION RANDOMISED TRIAL (HED-SMART) - A PRACTICAL LOW INTENSITY INTERVENTION TO IMPROVE ADHERENCE AND CLINICAL MARKERS. ERA-EDTA Istanbul. Cobb, J., Cule, E., Moncrieffe, H., Flynn, E., Hinks, A., Patrick, F. … Thomson, W. (2012). Genome-Wide Association Study of Methotrexate Response Identifies Novel Genes in a Large Cohort of European Juvenile Idiopathic Arthritis Cases. Griva, K., Mooppil, N. and Newman, S. (2012). THE HEMODIALYSIS SELF MANAGEMENT RANDOMISED CONTROLLED TRIAL [HED-SMART] - THE EFFECTIVENESS OF A GROUP SELF MANAGEMENT INTERVENTION TO IMPROVE TREATMENT ADHERENCE IN HEMODIALYSIS PATIENTS. Davies, A.K. and Newman, S. (2011). A systematic review to examine the effect of telecare for people with social care needs on outcomes for their informal carers. International Congress on Telecare and Telehealth Kings Fund, London. Cleanthous, S., Newman, S., Shipley, M., Ehrenstein, M.R., Isenberg, D. and Cano, S. (2011). EXPLORING PATIENT UNCERTAINTY IN RHEUMATIC CONDITIONS: COMPARING THE VIEWS OF HEALTH CARE PROFESSIONALS AND PATIENTS IN A QUALITATIVE DESIGN. James, H., Newman, S., Shipley, M., Olaleye, A., Moore, S. and & Members of the Appearance Research Collaboration, (2009). In the context of Rheumatoid Arthritis does appearance matter? European League Against Rheumatism Annual Conference, Copenhagen, Denmark. James, H., Newman, S., Ezra, D., Sapp, N., Rose, G. and & Members of the Appearance Research Collaboration, (2009). Psychological well-being and appearance concerns of patients with an ocular prosthesis. Royal College of Ophthalmologists Annual Congress, Birmingham. Kirwan, J.R., Newman, S., Tugwell, P.S., Wells, G.A., Hewlett, S., Idzera, L. … Welch, V. (2009). Progress on Incorporating the Patient Perspective in Outcome Assessment in Rheumatology and the Emergence of Life Impact Measures at OMERACT 9. Newman, S.P. (2008). Telehealth to self management in long term conditions. International Conference on Chronic Disease Self management November, Melbourne. Newman, S., Mulligan, K. and Shipley, M. (2007). Psychological influences on disease outcome. Newman, S., Hurel, S., Cooke, D., Steed, L., Ahlquist, J., Weaver, J. … Nunn, A. (2007). RCT of continuous glucose monitoring devices on HbA(1C) - The MITRE study. Cooke, D., Steed, L., Hurel, S.J., Nunn, A., Ahlquist, J., Weaver, J. … Newman, S. (2007). Use and acceptability of two minimally invasive continuous blood glucose monitors. Newman, S.P. (2006). Lifestyle change and chronic illness. International Forum for Social Sciences and Health - “HEALTH CHALLENGES OF THE THIRD MILLENNIUM 21-26 August, Yeditepe University, Istanbul. Newman, S.P. (2006). Findings and methods in the assessment of POCD in non cardiac surgery. American Anaesthetic Association Chicago. Newman, S.P. (2005). Life Styles and Chronic Disease. . IFSSH World Congress, Health Challenges of the Third Millennium 21-26 August, Yeditepe University - Istanbul, Turkey. Newman, S.P. (2005). The impact of couples level of agreement in cognitions regarding a myocardial infarction. Symposium, American Psychological Association August, Washington. Newman, S.P. (2005). Overcoming patient barriers in post mi care. Conference Post MI heart Failure – Returning patients to full functioning June, Royal College of Physicians. Newman, S.P. (2005). What are the best methods for translating results of team care studies into clinical practice? A focus on communication. CARE CONFERENCE May, Toronto, Canada. Newman, S.P. (2004). Can people care for their own health? 7th BSH Annual Autumn Meeting 2004/CHD Collaborative Joint Event ‘Heart failure: translating evidence into practice’ 25-26 November. Newman, S.P. (2004). Facilitating the development of self management skills. British Association of Cardiac Rehabilitation November, Harrogate. Newman, S.P. (2004). Evaluating neuroprotective agents in coronary artery bypass surgery. Neurprotection November, Monterey California. Newman, S.P. (2004). Patients’ perceptions of their treatment and illness before and after coronary artery bypass surgery. Symposium, American Psychological Association August, Hawaii. Newman, S.P. (2004). Design and analysis of self management / psycho-educational studies in arthritis. OMERACT Meeting May, California. Newman, S.P. (2004). Ernest Fletcher Lecture: Patients expectation of the course of their arthritis. Royal Society of Medicine February. Newman, S.P. (2004). Psychological approaches to the management of pain in rheumatic disease. EULAR Annual Conference Berlin. Newman, S.P. (2003). Surgery and the brain: Evidence for post operative cognitive dysfunction. McGill Symposium November, Imperial College, London. Newman, S.P. (2003). Psychology and Cardiac Rehabilitation. British Association of Cardiac Rehabilitation Annual Conference November, Harrogate. Newman, S.P. (2003). Engaging patients in management of their cardiovascular health. Royal College of Physicians November. McGown, A.D., Makker, H.K., Stygall, J., Harrington, J., Smith, C., Luo, Y.M. … Spiro, S.G. (2003). Relationship between polysomnographic measures of sleep fragmentation and hypoxaemia and measures of daytime sleepiness in consecutive patients with obstructive sleep apnoea (OSA) referred to a sleep clinic. Newman, S.P. (2002). Long term impact of coronary artery bypass graft surgery on cognition. VII International Congress of Behavioural Medicine August, Helsinki. Schonenberg, H., Pauws, S., Chouvarda, I., Bescos, C., Newman, S., Roca, J. … Keenoy, E.D.M. What does it take to make integrated care work? Griva, K., Rajeswari, M., Nandakumar, M., Khoo, E.Y.H., Lee, V.Y.W., Chua, C.G. … Newman, S.P. (2019). The combined diabetes and renal control trial (C-DIRECT) - a feasibility randomised controlled trial to evaluate outcomes in multi-morbid patients with diabetes and on dialysis using a mixed methods approach. BMC Nephrology, 20(1). doi:10.1186/s12882-018-1183-z . Piggin, L.H. and Newman, S.P. (2019). Measuring and monitoring cognition in the postoperative period. Best Practice and Research: Clinical Anaesthesiology. doi:10.1016/j.bpa.2018.11.002 . McBain, H., Shipley, M. and Newman, S. (2018). Clinician and Patient Views About Self-Management Support in Arthritis: A Cross-Sectional UK Survey. Arthritis Care and Research, 70(11), pp. 1607–1613. doi:10.1002/acr.23540 . Bowyer, A.J., Heiberg, J., Sessler, D.I., Newman, S., Royse, A.G. and Royse, C.F. (2018). Validation of the cognitive recovery assessments with the Postoperative Quality of Recovery Scale in patients with low-baseline cognition. Anaesthesia, 73(11), pp. 1382–1391. doi:10.1111/anae.14402 . Griva, K., Lam, K.F.Y., Nandakumar, M., Ng, J.A.H., McBain, H. and Newman, S.P. (2018). The effect of brief self-management intervention for hemodialysis patients (HED-SMART) on trajectories of depressive and anxious symptoms. Journal of Psychosomatic Research, 113, pp. 37–44. doi:10.1016/j.jpsychores.2018.07.012 . McBain, H., Newman, S., Shipley, M., Olaleye, A. and Moore, S. (2018). Experiences of a patient-initiated self-monitoring service in inflammatory arthritis: A qualitative exploration. Musculoskeletal Care, 16(2), pp. 278–286. doi:10.1002/msc.1232 . Wickwar, S., McBain, H., Edmunds, M.R., Ezra, D.G., Rose, G.E. and Newman, S.P. (2018). Patients’ expectations for the functional and psychosocial outcomes of orbital decompression surgery for thyroid eye disease: a qualitative study. Psychology, Health and Medicine, 23(4), pp. 475–484. doi:10.1080/13548506.2017.1356930 . Griva, K., Nandakumar, M., Ng, J.A.H., Lam, K.F.Y., McBain, H. and Newman, S.P. (2017). Hemodialysis Self-management Intervention Randomized Trial (HED-SMART): A Practical Low-Intensity Intervention to Improve Adherence and Clinical Markers in Patients Receiving Hemodialysis. American Journal of Kidney Diseases. doi:10.1053/j.ajkd.2017.09.014 . Dwek, M.R., Rixon, L., Hurt, C., Simon, A. and Newman, S. (2017). Is there a relationship between objectively measured cognitive changes in patients with solid tumours undergoing chemotherapy treatment and their health-related quality of life outcomes? A systematic review. Psycho-Oncology, 26(10), pp. 1422–1432. doi:10.1002/pon.4331 . Hurt, C.S., Cleanthous, S. and Newman, S.P. (2017). Further explorations of illness uncertainty: carers’ experiences of Parkinson’s disease. Psychology and Health, 32(5), pp. 549–566. doi:10.1080/08870446.2017.1283041 . Griva, K., Stygall, J., Wilson, M.H., Martin, D., Levett, D., Mitchell, K. … West, J. (2017). Caudwell xtreme everest: A prospective study of the effects of environmental hypoxia on cognitive functioning. PLoS ONE, 12(3), pp. 1–15. doi:10.1371/journal.pone.0174277 . Yoong, R.K., Mooppil, N., Khoo, E.Y., Newman, S.P., Lee, V.Y., Kang, A.W. … Griva, K. (2017). Prevalence and determinants of anxiety and depression in end stage renal disease (ESRD). A comparison between ESRD patients with and without coexisting diabetes mellitus. Journal of Psychosomatic Research, 94, pp. 68–72. doi:10.1016/j.jpsychores.2017.01.009 . Phanareth, K., Vingtoft, S., Christensen, A.S., Nielsen, J.S., Svenstrup, J., Berntsen, G.K.R. … Kayser, L. (2017). The Epital Care Model: A New Person-Centered Model of Technology-Enabled Integrated Care for People With Long Term Conditions. JMIR research protocols, 6(1), pp. 1–15. doi:10.2196/resprot.6506 . Adams, G.G.W., McBain, H., MacKenzie, K., Hancox, J., Ezra, D.G. and Newman, S.P. (2016). Is strabismus the only problem? Psychological issues surrounding strabismus surgery. Journal of AAPOS, 20(5), pp. 383–386. doi:10.1016/j.jaapos.2016.07.221 . dwek, M., Rixon, L., Simon, A., Hurt, C. and Newman, S. (2016). Examining Chemotherapy-Related Cognitive Changes in Colorectal Cancer Patients: A Feasibility Trial. Cancer Open Access, 1(1), pp. 5–8. Mcbain, H., Shipley, M., Olaleye, A., Moore, S. and Newman, S. (2016). A patient-initiated DMARD self-monitoring service for people with rheumatoid or psoriatic arthritis on methotrexate: A randomised controlled trial. Annals of the Rheumatic Diseases, 75(7), pp. 1343–1349. doi:10.1136/annrheumdis-2015-207768 . Mackenzie, K., Hancox, J., Mcbain, H., Ezra, D.G., Adams, G. and Newman, S. (2016). Psychosocial interventions for improving quality of life outcomes in adults undergoing strabismus surgery. Cochrane Database of Systematic Reviews, 2016(5). doi:10.1002/14651858.CD010092.pub4 . McBain, H.B., Mackenzie, K.A., Hancox, J., Ezra, D.G., Adams, G.G.W. and Newman, S.P. (2016). Does strabismus surgery improve quality and mood, and what factors influence this? Eye (Basingstoke), 30(5), pp. 656–667. doi:10.1038/eye.2016.70 . Dario, C., Luisotto, E., Dal Pozzo, E., Mancin, S., Aletras, V., Newman, S. … Saccavini, C. (2016). Assessment of patients’ perception of telemedicine services using the service user technology acceptability questionnaire. International Journal of Integrated Care, 16(2). doi:10.5334/ijic.2219 . McBain, H., MacKenzie, K., Hancox, J., Ezra, D.G., Adams, G.G.W. and Newman, S.P. (2016). What do patients with strabismus expect post surgery? the development and validation of a questionnaire. British Journal of Ophthalmology, 100(3), pp. 415–419. doi:10.1136/bjophthalmol-2015-307027 . Cleanthous, S., Isenberg, D.A., Newman, S.P. and Cano, S.J. (2016). Patient Uncertainty Questionnaire-Rheumatology (PUQ-R): Development and validation of a new patient-reported outcome instrument for systemic lupus erythematosus (SLE) and rheumatoid arthritis (RA) in a mixed methods study. Health and Quality of Life Outcomes, 14(1). doi:10.1186/s12955-016-0432-8 . McBain, H., Shipley, M. and Newman, S. (2015). The impact of self-monitoring in chronic illness on healthcare utilisation: A systematic review of reviews. BMC Health Services Research, 15(1). doi:10.1186/s12913-015-1221-5 . Yang, F., Griva, K., Lau, T., Vathsala, A., Lee, E., Ng, H.J. … Luo, N. (2015). Health-related quality of life of Asian patients with end-stage renal disease (ESRD) in Singapore. Quality of Life Research, 24(9), pp. 2163–2171. doi:10.1007/s11136-015-0964-0 . Hancox, J., Mackenzie, K., Mcbain, H., Ezra, D.G., Adams, G. and Newman, S. (2015). Psychosocial interventions for improving quality of life outcomes in adults undergoing strabismus surgery. Cochrane Database of Systematic Reviews, 2015(8). doi:10.1002/14651858.CD010092.pub3 . Dwek, M.-.R., Rixon, L., Simon, A. and Newman, S. (2015). Examining the Effects of Adjuvant Chemotherapy Treatment on Cognition in Colorectal Cancer Patients: A Feasibility Trial. PSYCHO-ONCOLOGY, 24, pp. 329–329. Yang, F., Griva, K., Lau, T., Foo, M.W., Mooppil, N., Newman, S.P. … Luo, N. (2015). Health-related quality of life in patients treated with continuous Ambulatory Peritoneal Dialysis and Automated Peritoneal Dialysis in Singapore. Value in Health, 18(3). doi:10.1016/j.jval.2015.03.280 . Yang, F., Griva, K., Griva, K., Lau, T., Vathsala, A., Lee, E. … Luo, N. (2015). Health-related quality of life of Asian patients with end-stage renal disease (ESRD) in Singapore. Quality of Life Research. doi:10.1007/s11136-015-0964-0 . Dwek, M.R., Mcbain, H., Cleanthous, S., Shipley, M. and Newman, S. (2015). Osteoarthritis: Patient Expectations about Future Pain, Stiffness and Function. Musculoskeletal Care, 13(2), pp. 84–92. doi:10.1002/msc.1089 . Griva, K., Mooppil, N., Khoo, E., Lee, V.Y.W., Kang, A.W.C. and Newman, S.P. (2015). Improving outcomes in patients with coexisting multimorbid conditions-the development and evaluation of the combined diabetes and renal control trial (C-DIRECT): Study protocol. BMJ Open, 5(2). doi:10.1136/bmjopen-2014-007253 . Ng, H.J., Tan, W.J., Mooppil, N., Newman, S. and Griva, K. (2015). Prevalence and patterns of depression and anxiety in hemodialysis patients: A 12-month prospective study on incident and prevalent populations. British Journal of Health Psychology, 20(2), pp. 374–395. doi:10.1111/bjhp.12106 . Dwek, M.R., Rixon, L., Simon, A., Hurt, C. and Newman, S. (2015). Examining the effects of adjuvant chemotherapy on cognition and the impact of any cognitive impairment on quality of life in colorectal cancer patients: Study protocol. BMC Psychology, 3(1). doi:10.1186/S40359-015-0100-5 . Hancox, J., Mackenzie, K., Mcbain, H., Ezra, D.G., Adams, G. and Newman, S. (2014). Psychosocial interventions for improving quality of life outcomes in adults undergoing strabismus surgery. Cochrane Database of Systematic Reviews, 2014(12). doi:10.1002/14651858.CD010092.pub2 . Steed, L., Barnard, M., Hurel, S., Jenkins, C. and Newman, S. (2014). How does change occur following a theoretically based self-management intervention for type 2 diabetes. Psychology, Health and Medicine, 19(5), pp. 536–546. doi:10.1080/13548506.2013.845301 . Panagioti, M., Richardson, G., Small, N., Murray, E., Rogers, A., Kennedy, A. … Bower, P. (2014). Self-management support interventions to reduce health care utilisation without compromising outcomes: A systematic review and meta-analysis. BMC Health Services Research, 14(1). doi:10.1186/1472-6963-14-356 . Steventon, A., Bardsley, M., Doll, H., Tuckey, E. and Newman, S.P. (2014). Effect of telehealth on glycaemic control: Analysis of patients with type 2 diabetes in the Whole Systems Demonstrator cluster randomised trial. BMC Health Services Research, 14(1). doi:10.1186/1472-6963-14-334 . MacNeill, V., Sanders, C., Fitzpatrick, R., Hendy, J., Barlow, J., Knapp, M. … Newman, S.P. (2014). Experiences of front-line health professionals in the delivery of telehealth: A qualitative study. British Journal of General Practice, 64(624). doi:10.3399/bjgp14X680485 . McBain, H.B., MacKenzie, K.A., Au, C., Hancox, J., Ezra, D.G., Adams, G.G.W. … Newman, S.P. (2014). Factors associated with quality of life and mood in adults with strabismus. Br J Ophthalmol, 98(4), pp. 550–555. doi:10.1136/bjophthalmol-2013-304220 . Royse, C.F., Williams, Z., Purser, S. and Newman, S. (2014). Recovery after nasal surgery vs. tonsillectomy: Discriminant validation of the Postoperative Quality of Recovery Scale. Acta Anaesthesiologica Scandinavica, 58(3), pp. 345–351. doi:10.1111/aas.12264 . Griva, K., Lai, A.Y., Lim, H.A., Yu, Z., Foo, M.W.Y. and Newman, S.P. (2014). Non-adherence in patients on peritoneal dialysis: A systematic review. PLoS ONE, 9(2). doi:10.1371/journal.pone.0089001 . Tyagi, M., Austin, K., Stygall, J., Deanfield, J., Cullen, S. and Newman, S.P. (2014). What do we know about cognitive functioning in adult congenital heart disease? Cardiol Young, 24(1), pp. 13–19. doi:10.1017/S1047951113000747 . McBain, H.B., Ezra, D.G., Rose, G.E., Newman, S.P. and Appearance Research Collaboration, (2014). The psychosocial impact of living with an ocular prosthesis. Orbit, 33(1), pp. 39–44. doi:10.3109/01676830.2013.851251 . Newman, S., Wilkinson, D.J. and Royse, C.F. (2014). Assessment of early cognitive recovery after surgery using the Post-operative Quality of Recovery Scale. ACTA ANAESTHESIOLOGICA SCANDINAVICA, 58(2), pp. 185–191. doi:10.1111/aas.12234 . Griva, K., Kang, A.W., Yu, Z.L., Mooppil, N.K., Foo, M., Chan, C.M. … Newman, S.P. (2014). Quality of life and emotional distress between patients on peritoneal dialysis versus community-based hemodialysis. Quality of Life Research, 23(1), pp. 57–66. doi:10.1007/s11136-013-0431-8 . McBain, H.B., Ezra, D.G., Rose, G.E., Newman, S.P., Byron-Daniel, J., Charlton, R. … Newman, S. (2014). The psychosocial impact of living with an ocular prosthesis. Orbit, 33(1), pp. 39–44. doi:10.3109/01676830.2013.851251 . McBain, H., Au, C., Hancox, J., MacKenzie, K., Ezra, D., Adams, G. … Newman, S. (2014). The impact of strabismus on quality of life in adults with and without diplopia: a systematic review. Survey of Ophthalmology. Royse, C.F., Williams, Z., Purser, S. and Newman, S. (2014). Recovery after nasal surgery vs. tonsillectomy: Discriminant validation of the Postoperative Quality of Recovery Scale. Acta Anaesthesiologica Scandinavica. Royse, C.F., Williams, Z., Ye, G., Wilkinson, D., De Steiger, R., Richardson, M. … Newman, S. (2014). Knee surgery recovery: Post-operative Quality of Recovery Scale comparison of age and complexity of surgery. Acta Anaesthesiologica Scandinavica. McBain, H.B., MacKenzie, K.A., Au, C., Hancox, J., Ezra, D.G., Adams, G.G.W. … Newman, S.P. (2014). Factors associated with quality of life and mood in adults with strabismus. British Journal of Ophthalmology, 98(4), pp. 550–555. doi:10.1136/bjophthalmol-2013-304220 . Royse, C.F., Williams, Z., Ye, G., Wilkinson, D., De Steiger, R., Richardson, M. … Newman, S. (2014). Knee surgery recovery: Post-operative Quality of Recovery Scale comparison of age and complexity of surgery. Acta Anaesthesiologica Scandinavica, 58(6), pp. 660–667. doi:10.1111/aas.12273 . Davies, A., Rixon, L. and Newman, S. (2013). Systematic review of the effects of telecare provided for a person with social care needs on outcomes for their informal carers. Health Soc Care Community, 21(6), pp. 582–597. doi:10.1111/hsc.12035 . Leroi, I., Woolham, J., Gathercole, R., Howard, R., Dunk, B., Fox, C. … Ritchie, C. (2013). Does telecare prolong community living in dementia? A study protocol for a pragmatic, randomised controlled trial. Trials, 14(1). doi:10.1186/1745-6215-14-349 . Cleanthous, S., Isenberg, D.A., Newman, S.P. and Cano, S.J. (2013). Development and validation of a new patient reported instrument of uncertainty in systemic lupus erythematosus (SLE) and rheumatoid arthritis (RA). QUALITY OF LIFE RESEARCH, 22. Royse, C.F., Newman, S., Williams, Z. and Wilkinson, D.J. (2013). A human volunteer study to identify variability in performance in the cognitive domain of the postoperative quality of recovery scale. Anesthesiology, 119(3), pp. 576–581. doi:10.1097/ALN.0b013e318299f72b . Nolte, S., Elsworth, G.R., Newman, S. and Osborne, R.H. (2013). Measurement issues in the evaluation of chronic disease self-management programs. Quality of Life Research, 22(7), pp. 1655–1664. doi:10.1007/s11136-012-0317-1 . Fteropoulli, T., Stygall, J., Cullen, S., Deanfield, J. and Newman, S.P. (2013). Quality of life of adult congenital heart disease patients: a systematic review of the literature. Cardiol Young, 23(4), pp. 473–485. doi:10.1017/S1047951112002351 . Wickwar, S., Buerkle, K., McBain, H., Ciciriello, S., Osborne, R.H., Wedderburn, L.R. … Newman, S.P. (2013). Adaptation of the methotrexate in rheumatoid arthritis knowledge questionnaire (MiRAK) for use with parents of children with juvenile idiopathic arthritis: a qualitative study. Pediatr Rheumatol Online J, 11(1), p. 27. doi:10.1186/1546-0096-11-27 . Steventon, A., Bardsley, M., Billings, J., Dixon, J., Doll, H., Beynon, M. … Newman, S. (2013). Effect of telecare on use of health and social care services: findings from the Whole Systems Demonstrator cluster randomised trial. Age Ageing, 42(4), pp. 501–508. doi:10.1093/ageing/aft008 . Charlesworth, G., Melunsky, N., Orrell, M. and Newman, S. (2013). Mixed emotion in carers as predictor of service use and care-recipient outcome. PSYCHOLOGY & HEALTH, 28, pp. 12–12. Beynon, M., Hirani, S.P., Cartwright, M., Rixon, L. and Newman, S.P. (2013). Does carer quality of life benefit from care-recipients receiving telecare? A case-control prospective study. PSYCHOLOGY & HEALTH, 28, pp. 12–12. Leow, M.K.S., Griva, K., Choo, R., Wee, H.L., Thumboo, J., Tai, E.S. … Newman, S. (2013). Determinants of Health-Related Quality of Life (HRQoL) in the Multiethnic Singapore Population - A National Cohort Study. PLoS ONE, 8(6). doi:10.1371/journal.pone.0067138 . Mulligan, K., Kassoumeri, L., Etheridge, A., Moncrieffe, H., Wedderburn, L.R. and Newman, S. (2013). Mothers' reports of the difficulties that their children experience in taking methotrexate for Juvenile Idiopathic Arthritis and how these impact on quality of life. Pediatr Rheumatol Online J, 11(1), p. 23. doi:10.1186/1546-0096-11-23 . Henderson, C., Knapp, M., Fernández, J.L., Beecham, J., Hirani, S.P., Cartwright, M. … Newman, S.P. (2013). Cost effectiveness of telehealth for patients with long term conditions (Whole Systems Demonstrator telehealth questionnaire study): Nested economic evaluation in a pragmatic, cluster randomised controlled trial. BMJ (Online), 346(7902). doi:10.1136/bmj.f1035 . Griva, K., Davenport, A. and Newman, S.P. (2013). Health-related quality of life and long-term survival and graft failure in kidney transplantation: A 12-year follow-up study. Transplantation, 95(5), pp. 740–749. doi:10.1097/TP.0b013e31827d9772 . Martin Cartwright, , Hirani, S.P., Rixon, L., Beynon, M., Doll, H., Bower, P. … Newman, S.P. (2013). Effect of telehealth on quality of life and psychological outcomes over 12 months (Whole Systems Demonstrator telehealth questionnaire study): Nested study of patient reported outcomes in a pragmatic, cluster randomised controlled trial. BMJ (Online), 346(7897). doi:10.1136/bmj.f653 . Thuné-Boyle, I.C.V., Stygall, J., Keshtgar, M.R.S., Davidson, T.I. and Newman, S.P. (2013). Religious/spiritual coping resources and their relationship with adjustment in patients newly diagnosed with breast cancer in the UK. Psycho-Oncology, 22(3), pp. 646–658. doi:10.1002/pon.3048 . Royse, C.F., Chung, F., Newman, S., Stygall, J. and Wilkinson, D.J. (2013). Predictors of patient satisfaction with anaesthesia and surgery care: a cohort study using the Postoperative Quality of Recovery Scale. Eur J Anaesthesiol, 30(3), pp. 106–110. doi:10.1097/EJA.0b013e328357e584 . McBain, H., Shipley, M., Newman, S., Rumsey, N., Newman, S., Newell, R. … Saul, K. (2013). The Impact of Appearance Concerns on Depression and Anxiety in Rheumatoid Arthritis. Musculoskeletal Care, 11(1), pp. 19–30. doi:10.1002/msc.1020 . Cleanthous, S., Newman, S.P., Shipley, M., Isenberg, D.A. and Cano, S.J. (2013). What constitutes uncertainty in systemic lupus erythematosus and rheumatoid arthritis? Psychol Health, 28(2), pp. 171–188. doi:10.1080/08870446.2012.701628 . Griva, K., Ng, H.J., Loei, J., Mooppil, N., McBain, H. and Newman, S.P. (2013). Managing treatment for end-stage renal disease - A qualitative study exploring cultural perspectives on facilitators and barriers to treatment adherence. PSYCHOLOGY & HEALTH, 28(1), pp. 13–29. doi:10.1080/08870446.2012.703670 . Griva, K., Mooppil, N., Krishnan, D.S.P., McBain, H.B. and Newman, S. (2013). Short and long-term outcomes of the hemodialysis self-management intervention randomised trial (hed-smart) - a practical low intensity intervention to improve adherence and clinical markers. Nephrology, Dialysis & Transplantation, 28(Suppl 1). Steed, L., Barnard, M., Hurel, S., Jenkins, C. and Newman, S. (2013). How does change occur following a theoretically based self-management intervention for type 2 diabetes. Psychology, Health and Medicine. Hendy, J., Chrysanthaki, T., Barlow, J., Knapp, M., Rogers, A., Sanders, C. … Newman, S. (2012). An organisational analysis of the implementation of telecare and telehealth: The whole systems demonstrator. BMC Health Services Research, 12(1). doi:10.1186/1472-6963-12-403 . Griva, K., Davenport, A., Harrison, M. and Newman, S.P. (2012). The impact of treatment transitions between dialysis and transplantation on illness cognitions and quality of life - A prospective study. BRITISH JOURNAL OF HEALTH PSYCHOLOGY, 17, pp. 812–827. doi:10.1111/j.2044-8287.2012.02076.x . Baron, J., McBain, H. and Newman, S. (2012). The impact of mobile monitoring technologies on glycosylated hemoglobin in diabetes: a systematic review. J Diabetes Sci Technol, 6(5), pp. 1185–1196. doi:10.1177/193229681200600524 . Steventon, A. and Newman, S. (2012). Acute skin failure reply. BRITISH MEDICAL JOURNAL, 345. doi:10.1136/bmj.e5305 . Griva, K., Davenport, A., Harrison, M. and Newman, S.P. (2012). Non-Adherence to immunosuppressive medications in kidney transplantation: Intent Vs. forgetfulness and clinical markers of medication intake. Annals of Behavioral Medicine, 44(1), pp. 85–93. doi:10.1007/s12160-012-9359-4 . Steventon, A., Bardsley, M., Billings, J., Dixon, J., Doll, H., Hirani, S. … Newman, S. (2012). Effect of telehealth on use of secondary care and mortality: Findings from the Whole System Demonstrator cluster randomised trial. BMJ (Online), 344(7865). doi:10.1136/bmj.e3874 . Geenen, R., Newman, S., Bossema, E.R., Vriezekolk, J.E. and Boelen, P.A. (2012). Psychological interventions for patients with rheumatic diseases and anxiety or depression. Best Practice and Research: Clinical Rheumatology, 26(3), pp. 305–319. doi:10.1016/j.berh.2012.05.004 . Cleanthous, S., Tyagi, M., Isenberg, D.A. and Newman, S.P. (2012). What do we know about self-reported fatigue in systematic lupus erythematosus? Lupus. doi:10.1177/0961203312436863 . Mcbain, H., Shipley, M. and Newman, S. (2012). The Impact of Appearance Concerns on Depression and Anxiety in Rheumatoid Arthritis. Musculoskeletal Care. Ciere, Y., Cartwright, M. and Newman, S.P. (2012). A systematic review of the mediating role of knowledge, self-efficacy and self-care behaviour in telehealth patients with heart failure. JOURNAL OF TELEMEDICINE AND TELECARE, 18(7), pp. 384–391. doi:10.1258/jtt.2012.111009 . Hancox, J., MacKenzie, K., McBain, H., Ezra, D.G., Adams, G. and Newman, S. (2012). Psychosocial interventions for improving quality of life outcomes in adults undergoing strabismus surgery (Protocol). Cochrane Database of Systematic Reviews. Mackenzie, K.A., McBain, H.B., Hancox, J.C., Erza, D.G., Adams, G.G. and Newman, S. (2012). Mood and quality of life in adults with strabismus. Journal of American Association for Pediatric Ophthalmology and Strabismus, 17(1). Au, C., James, H., Mackenzie, K., Hancox, J., Ezra, D., Adams, G. … Newman, S. (2011). THE PSYCHOLOGICAL STATUS OF ADULTS WITH STRABISMUS SEEKING SURGERY. CLINICAL AND EXPERIMENTAL OPHTHALMOLOGY, 39, pp. 73–74. Royse, C.F., Andrews, D.T., Newman, S.N., Stygall, J., Williams, Z., Pang, J. … Royse, A.G. (2011). The influence of propofol or desflurane on postoperative cognitive dysfunction in patients undergoing coronary artery bypass surgery. Anaesthesia. doi:10.1111/j.1365-2044.2011.06704.x . Griva, K., Nandakumar, M., Seet, P., Palakrishna, P., James, H.B. and Newman, S. (2011). The NKF NUS hemodialysisis trial protocol – a randomized controlled trial to determine the effectiveness of a self management intervention for hemodialysis patients. BMC Nephrology, 12(4). James, H., Jenkinson, E., Harrad, R., Ezra, D.G., Newman, S., Rumsey, N. … Williams, E. (2011). Appearance concerns in ophthalmic patients. Eye, 25(8), pp. 1039–1044. doi:10.1038/eye.2011.116 . Thuné-Boyle, C.V., Stygall, J., Keshtgar, M.R.S., Davidson, T.I. and Newman, S.P. (2011). Religious coping strategies in patients diagnosed with breast cancer in the UK. Pyscho-Oncology, 20, pp. 771–782. Royse, C.F., Andrews, D.T., Newman, S.P., Stygall, J., Williams, Z., Pang, J. … Royse, A.G. (2011). The influence of propofol or desflurane on postoperative cognitive dysfunction in patients undergoing coronary artery bypass surgery. Journal of the Association of Anaesthetists of Great Britain and Ireland. doi:10.1111/j.1365-2044.2011.06704.x . James, H., Jenkinson, E., Harrad, R., Ezra, D.G., Newman, S.P. and members of the Appearance Research Collaboration, (2011). Appearance concerns in ophthalmic patients. Online Eye pp. 1–6. Griva, K., Stygall, J., NG, J., Davenport, A., Harrison, M.J. and Newman, S.P. (2011). Prospective Changes in Health-Related Quality of Life and Emotional Outcomes in Kidney Transplantation over 6 years. Journal of Transplantation. doi:10.1155/2011/671571 . Radar, T., Ueffing, E., Garcia-Elorrio, E., Idzerda, L., Ciapponi, A., Irazola, V. … Newman, S.P. (2011). Influencing health equity: Role of the effective consumer scale in measuring skills and abilities in a middle income country. The Journal of Rheumatology, 38, pp. 1798–8020. doi:10.3899/jrheum.110407 . Buchbinder, R., Battersham, R., Ciciriello, S., Newman, S.P., Horgan, B., Ueffing, E. … Osborne, R.H. (2011). Health Literacy: What is it and Why is it Important to Measure? Journal of Rheumatology, 38, pp. 1791–1797. doi:10.3899/jrheum.110406 . Kirwan, J.R., Fries, J.F., Hewlett, S.E., Osborne, R.H., Newman, S.P., Ciciriello, S. … Richards, P. (2011). Patient Perspective Workshop: Moving Towards OMERACT Guidelines for Choosing or Developing Instruments to Measure Patient-Reported Outcomes. The Journal of Rheumatology, 38, pp. 1711–1715. doi:10.3899/jrheum.110391 . Cartwright, M., Ciere, Y. and Newman, S. (2011). Telehealth for heart failure: exploring the mechanism of effect-a systematic review of self-care behaviour. INTERNATIONAL JOURNAL OF INTEGRATED CARE, 11. Baron, J. and Newman, S. (2011). A systematic review of the effectiveness of mobile health interventions for the management of diabetes. INTERNATIONAL JOURNAL OF INTEGRATED CARE, 11. Ezra, D.G., James, H., Minakaran, N., Dart, J. and Newman, S. (2011). Emotional functioning after keratoplasty. Ophthalmology, 118(4). doi:10.1016/j.ophtha.2010.12.006 . Au, C., McBain, H.B., Mackenzie, K., Hancox, J., Ezra, D., Adams, G. … Newman, S. (2011). The psychological status of adults with strabismus seeking surgery. Clinical and Experimental Ophthalmology, 39, pp. 53–74. Griva, K., Stygall, J., Hankins, M., Davenport, A., Harrison, M. and Newman, S.P. (2010). Cognitive impairment and 7-year mortality in dialysis patients. American Journal of Kidney Diseases, 56(4), pp. 693–703. doi:10.1053/j.ajkd.2010.07.003 . Griva, K., Davenport, A., Harrison, M. and Newman, S. (2010). An evaluation of illness, treatment perceptions, and depression in hospital- vs. home-based dialysis modalities. JOURNAL OF PSYCHOSOMATIC RESEARCH, 69(4), pp. 363–370. doi:10.1016/j.jpsychores.2010.04.008 . Cleanthous, S., Shipley, M., Isenberg, D., Newman, S. and Cano, S. (2010). Uncertainty in Systemic Lupus Erythematosus (SLE): Development of a Conceptual Model. QUALITY OF LIFE RESEARCH, 19, pp. 130–131. Thune-Boyle, I.C.V., Stygall, J., Keshtgar, M.R.S., Davidson, T.I. and Newman, S.P. (2010). The Impact of Breast Cancer Diagnosis on Religious/Spiritual Beliefs and Practices in the UK. Journal of Religious Health. Royce, C.F., Newman, S.P., Chung, F., Stygall, J., McKay, R.E., Boldt, J. … Wilkinson, D.J. (2010). The development of a scale to assess post-operative recovery: the Post-operative Quality of Recovery Scale (PQRS). Anesthesiology, 113. Griva, K., Stygall, J., Hankin, M., Davenport, A., Harrison, M. and Newman, S.P. (2010). Cognitive impairment predicts seven year mortality in dialysis patients. American Journal of Kidney Diseases, 56(4). Mulligan, K., Etheridge, A., Kassoumeri, L., Wedderburn, L.R. and Newman, S. (2009). Do Mothers and Fathers Hold Similar Views About Their Child's Arthritis? ARTHRITIS & RHEUMATISM-ARTHRITIS CARE & RESEARCH, 61(12), pp. 1712–1718. doi:10.1002/art.25008 . Newman, S.P., Cooke, D. and Casbard, A. (2009). Minimally invasive and conventional glucose monitoring did not differ for long-term glycemic control in insulin-treated diabetes. ANNALS OF INTERNAL MEDICINE, 151(8). doi:10.7326/0003-4819-151-8-200910200-02006 . Patel, R., Stygall, J., Harrington, J., Newman, S. and Haddad, F. (2009). Intra-operative cerebral microembolisation during primary hybrid total hip arthroplasty compared with primary hip resurfacing. ACTA ORTHOPAEDICA BELGICA, 75(5), pp. 671–677. Newman, S.P., Cooke, D., Casbard, A., Walker, S., Meredith, S., Nunn, A. … Hurel, S.J. (2009). A randomised controlled trial to compare minimally invasive glucose monitoring devices with conventional monitoring in the management of insulin-treated diabetes mellitus (MITRE). Health Technol Assess, 13(28), pp. iii–194. doi:10.3310/hta13280 . Newman, S.P., Cooke, D., Casbard, A., Walker, S., Meredith, S., Nunn, A. … Hurel, S.J. (2009). A randomised controlled trial to compare minimally invasive glucose monitoring devices with conventional monitoring in the management of insulin-treated diabetes mellitus (MITRE). Health Technology Assessment, 13(28). doi:10.3310/hta13280 . Phillips, A., Bassett, P., Zeki, S., Newman, S. and Pasvol, G. (2009). Risk factors for severe disease in adults with falciparum malaria. Clinical Infectious Diseases, 48(7), pp. 871–878. doi:10.1086/597258 . Griva, K., Jayasena, D., Davenport, A., Harrison, M. and Newman, S.P. (2009). Illness and treatment cognitions and health related quality of life in end stage renal disease. Br J Health Psychol, 14(Pt 1), pp. 17–34. doi:10.1348/135910708X292355 . Griva, K., Jayasena, D., Davenport, A., Harrison, M. and Newman, S.P. (2009). Illness and treatment cognitions and health related quality of life in end stage renal disease. British Journal of Health Psychology, 14(1), pp. 17–34. doi:10.1348/135910708X292355 . Wilson, M., Newman, S.P. and Imray, C. (2009). The cerebral effects of ascent to high altitude. Lancet Neurology, 8, pp. 175–191. Cooke, D., Hurel, S., Steed, L., Walker, S., Meredith, S., Nunn, A.J. … Newman, S.P. (2009). Randomized controlled trial to assess the impact of continuous monitoring on HbA1c insulin-treated diabetes (MITRE Study). Diabetic Medicine, 26, pp. 540–547. Stygall, J., Suvarna, S., Harrington, J., Hayward, M., Walesby, R. and Newman, S.P. (2009). Effect on the Brain of Two Techniques of Myocardial Protection. Asian Cardiovascular and Thoracic Annals, 17, pp. 259–265. Epstein, R., Hirani, S., Stygall, J. and Newman, S.P. (2009). How do Individuals Cope with Voice Disorders? Introducing the Voice Disability Coping Questionnaire. Journal of Voice, 23, pp. 209–217. Geenen, R., Mulligan, K., Shipley, M. and Newman, S.P. (2009). Psychological dimensions of the rheumatic diseases. Psychosocial Dimensions pp. 637–652. Patel, R.V., Stygall, J., Harrington, J., Newman, S.P. and Haddad, F.S. (2009). Cerebral Microembolization during Primary Total Hip Arthroplasty and Neuropsychological Outcomes. Clinical Orthopaedics and Related Research, The Association of Bone and Joint Surgeons. Pasvol, G., Phillips, A., Bassett, P., Szeki, S. and Newman, S. (2008). RISK FOR SEVERE DISEASE IN ADULTS WITH FALCIPARUM MALARIA. AMERICAN JOURNAL OF TROPICAL MEDICINE AND HYGIENE, 79(6), pp. 350–350. Newman, S.P. (2008). Chronic disease self-management approaches within the complex organisational structure of a health care system. Medical Journal of Australia, 189(10 SUPPL.). Mulligan, K., Etheridge, A., Kassoumeri, L., Wedderburn, L.R. and Newman, S. (2008). Do mothers and fathers hold similar views about their child's arthritis? PSYCHOLOGY & HEALTH, 23, pp. 189–190. Dodd, L. and Newman, S. (2008). Predicating physical activity intention and behaviour using the TPB within students: Gender specific. PSYCHOLOGY & HEALTH, 23, pp. 107–108. Davies, A., Prestwich, A., Newman, S. and Michie, S. (2008). Evaluating the theoretical base of an intervention to change attitudes towards MMR vaccination. PSYCHOLOGY & HEALTH, 23, pp. 25–25. Cooke, D., Steed, L., Hurel, S. and Newman, S. (2008). The Impact of Continuous Glucose Monitoring (CGM) on Fear of Hypoglycaemia (FH) in Diabetes. PSYCHOLOGY & HEALTH, 23, pp. 89–90. Cleanthous, S., Cooke, D., Kirk, A., Isenberg, D. and Newman, S. (2008). Illness perception questionnaire: An investigation of the structure of illness perceptions in systemic lupus erythematosus. PSYCHOLOGY & HEALTH, 23, pp. 87–88. Kidd, T., Kirk, A., Shipley, M. and Newman, S. (2008). Comparing long-term expectations of physical function between individuals with rheumatoid arthritis (RA) and their rheumatologists. PSYCHOLOGY & HEALTH, 23, pp. 159–160. Steed, L., Cooke, D., Hurel, S.J. and Newman, S.P. (2008). Development and Piloting of an Acceptability Questionnaire for Continuous Glucose Monitoring Devices. Diabetes Technology & Therapeutics, 10, pp. 95–101. Ackland, G.L., Harrington, J., Downie, P., Holding, J.W., Singh-Ranger, D., Griva, K. … Newman, S.P. (2008). Dehydration induced by bowel preparation in older adults does not result in cognitive dysfunction. International Anesthesia Research Society, 106(3), pp. 924–929. Brown, C., Yap, T., Cromwell, D., Rixon, L., Steed, L., Mulligan, K. … Emberton, M. (2007). Self-management benefits men with lower urinary tract symptoms: a randomised controlled trial. BMJ: British Medical Journal, 334, pp. 25–29. Newman, S.P., Stygall, J., Hirani, S., Shaefi, S. and Maze, M. (2007). Postoperative cognitive dysfunction after non-cardiac surgery. Anesthesiology, 106, pp. 572–590. Charlesworth, G., Tzimoula, X. and Newman, S.P. (2007). Carers Assessment of Difficulties Index (CADI): psychometric properties for use with Carers of people with dementia. Ageing & Mental Health, 11(2), pp. 218–225. Jeres, W., Madland, G., Feinmann, C., El Maaytah, M., Kumar, M., Hopper, C. … Newman, S.P. (2007). Psycho-educational programme for temporomandibular disorders: a pilot study. Journal of Negative Results in Biomedicine, 6(4). doi:10.1186/1477-5751-6-4 . Jeres, W., Hoper, C., Kumar, M., Upile, T., Madland, G., Newman, S.P. … Feinmann, C. (2007). Psychological interventions in acute dental pain: review. British Dental Journal, 202, pp. 337–343. Jeres, W., Madland, G., Feinmann, C., Hopper, C., Kumar, M., Upile, T. … Newman, S.P. (2007). A psychological camparison of temporomandibular disorder and chronic daily headache: are there targets for therapeutic interventions? Oral Surgery, Oral, Medicine, Oral Pathology, Oral Radiology and Endodontics, 103, pp. 367–373. Cooke, D., Newman, S.P., Sacker, A., Devellis, B., Bebbington, P.E. and Meltzer, H. (2007). The impact of physical illness on non-psychotic psychiatric morbidity: Data from the household survey of psychiatric morbidity in Great Britain. British Journal of Health Psychology, 12, pp. 463–471. Whitaker, D.C., Green, A.J.E., Stygall, J., Harison, M.J.G. and Newman, S.P. (2007). Evaluation of an alternative S100b assay for use in cardiac surgery: Relationship with microemboli and neuropsychology outcome. Perfusion, 22, pp. 267–272. Suvarna, S., Smith, A., Stygall, J., Walesby, R., Harrison, M. and Newman, S.P. (2007). An intraoperative assessment of ascending aorta: Comparison of digital palpation, transoesophageal and epiaortic untrasonography. Journal of Cardiothoracic and Vascular Anesthesia, 21, pp. 805–809. Hirani, S.P., Hyam, J.A., Shaefi, S., Walker, J.M., Walesby, R.K. and Newman, S.P. (2006). An examination of factors influencing the choice of therapy for patients with coronary artery disease. BMC Cardiovasc Disord, 6, p. 31. doi:10.1186/1471-2261-6-31 . Whitaker, D.C., Stygall, J., Harison, M.J.G., Mackie, I.J., Kemp, M., Hooper, J. … Newman, S.P. (2006). Leucocyte depleting arterial line filtration does not reduce myocardial injury assessed by Troponin T during routine coronary artery bypass grafting using cross clamp fibrillation. Perfusion: Kreislauferkrankungen in Klinik und Praxis, 21, pp. 1–7. Thune-Boyle, A., Stygall, J.A., Keshtgar, M.R. and Newman, S.P. (2006). Do religious/spiritual coping strategies affect illness adjustment in patients with cancer? A systematic review of the literature. Social Science and Medicine, 63, pp. 151–164. Whitaker, D.C., Stygall, J., Hope-Wynne, C., Walesby, R., Newman, S.P. and Harrison, M.J.G. (2006). A prospective clinical study of cerebral microemboli and neuropsychological outcome comparing vent-line and auto-venting arterial line filters: both filters are equally safe. .
Whitaker, D., Stygall, J., Harrison, M.J.G. and Newman, S.P. (2006). Relationship between white cell count neuropsychological outcomes and microemboli in 161 patients having coronary artery bypass surgery. The Journal of Thoracic and Cardiovascular Surgery, 131, pp. 1358–1363. Rudell, K., Myers, L.B. and Newman, S.P. (2006). Preferences for involvement in medical decision making: Comparing British and German Views. Psychology, Health and Medicine, 11(2), pp. 171–189. Thune-Boyle, I., Myers, L.B. and Newman, S.P. (2006). The Role of Illness Beliefs, Treatment Beliefs and Perceived Severity of Symptoms in Explaining Distress in Cancer Patients During Chemotherapy Treatment. Behavioural Medicine, 32(1), pp. 19–29. Harrison, M.J.G., Stygall, J., Whitaker, D.C., Grundy, N.M. and Newman, S.P. (2006). Hematocrit during cardiopulmonary bypass. Letter, Annals of Thoracic Surgery, 82, p. 1166. Hirani, S. and Newman, S.P. (2006). Illness representation of coronary artery disease: An empirical examination of Illness Perceptions Questionnaire (IPQ) in patients undergoing surgery, angioplasty and medication. British Journal of Health Psychology, 11, pp. 199–220. Hirani, S., Hyam, J., Shaefi, S., Walker, M., Walesby, R. and Newman, S.P. (2006). An examination of factors Influencing the Choice of Therapy for Patients with Coronary Artery Disease. BMC Cardiovascular Disorders, 4(6), p. 31. Griva, K., Hansraj, S., Thompson, D., Jayasena, D., Davenport, A., Harrison, M. … Newman, S.P. (2006). Cognitive functioning pre-to-post- kidney transplantation: A prospective study. Nephrology, Dialysis & Transplantation, 11, pp. 3275–3282. Whitaker, D.C., Stygall, J., Harrison, M.J.G., Mackie, I.J., Kemp, M., Hooper, J. … Newman, S.P. (2006). Leucocyte-depleting arterial line filtration does not reduce myocardial injury assessed by Troponin T during routine coronary artery bypass grafting using crossclamp fibrillation. Perfusion, 21(1), pp. 55–60. doi:10.1191/0267659106pf847oa . Steed, L., Lankester, J., Barnard, M., Earle, K., Hurel, S. and Newman, S. (2005). Evaluation of the UCL diabetes self-management programme (UCL-DSMP): A randomized controlled trial. Journal of Health Psychology, 10(2), pp. 261–276. doi:10.1177/1359105305049775 . Steed, L., Lankester, J., Barnard, M., Hurel, S., Earle, K. and Newman, S.P. (2005). Evaluation of the UCL Diabetes Self-management programme (UCL-DSMP) in patients with Type II diabetes and microalbuminuria: A randomised controlled trial. Journal of Health Psychology, 10(2), pp. 261–276. Newman, S.P. and Hirani, S. (2005). Patients’ beliefs about their cardiovascular disease. Heart, 91, pp. 1235–1239. Kirwan, J.R., Hewlett, S., Heiberg, T., Hughes, R., Carr, M., Hehir, M. … Wale, J. (2005). Incorporating the patient perspective into outcome assessment in rheumatoid arthritis - progress at OMERACT 7. The Journal of Rheumatology, 32(11), pp. 2250–2256. Griva, K., Hansraj, S., Thompson, D., Jayasena, D., Davenport, A., Harrison, M. … Newman, S.P. (2004). Neuropsychological performance after kidney transplantation: a comparison between transplant types and in relation to dialysis and normative data. Nephrol Dial Transplant, 19(7), pp. 1866–1874. doi:10.1093/ndt/gfh141 . Mitchell, K.M., Mandeville, A.L., Manson, J., Olaleye, A., Shipley, M. and Newman, S.P. (2004). SELF-MONITORING OF BLOODS AND SYMPTOMS IN PATIENTS WITH RHEUMATOID ARTHRITIS RECEIVING METHOTREXATE. RHEUMATOLOGY, 43, pp. 139–139. Mandeville, A., Mulligan, K., Smith, J., Shipley, M. and Newman, S. (2004). OSTEO-ARTHRITIS, IDENTITY AND COPING; AN INTERPRETATIVE PHENOMENOLOGICAL APPROACH. RHEUMATOLOGY, 43, pp. 153–154. Whitaker, D.C., Newman, S.P., Stygall, J., Hope-Wynne, C., Harrison, M.J.G. and Walesby, K. (2004). The effect of leucocyte depleting arterial line filters on cerebral microemboli and neuropsychological outcome following coronary artery bypass surgery. European Journal of Cardiothoracic Surgery, 25, pp. 267–274. Griva, K., Hansraj, S., Thompson, D., Jayasena, D., Davenport, A., Harrison, M. … Newman, S.P. (2004). Neuropsychological Performance after Kidney Transplantation: A comparison between transplant types and in relation to dialysis and normative data. Nephrology Dialysis Transplantation pp. 1–9. Newman, S.P. (2004). Engaging patients in managing their cardiovascular health. Heart, 90(Supp IV), p. 1. Harrington, J., Noble, L. and Newman, S.P. (2004). Improving patients' communication with doctors: A systematic review of intervention studies. Patient Education and Counseling, 52, pp. 7–17. Taylor, J.C., Sterkel, B., Utley, M., Shipley, M., Newman, S.P., Horton, M. … Fitz-Clarence, H. (2004). Opinions and experiences in general practice on osteoporosis prevention, diagnosis and management. Osteoporosis, 12, pp. 844–848. Newman, S.P. (2004). Commentary on Supplement 44: G. ICF Core Sets for Chronic Conditions. Journal of Rehabilitation Medicine, 36, pp. 186–188. Gage, J.S., Newman, S., Kong, R.S., Butterworth, J., Aveling, W., Stump, D.A. … Rorie, K.D. (2003). The neuropsychologic deterioration seen in the placebo group may have been a result of rigorous exclusion criteria  (multiple letters). Anesthesiology, 98(6), p. 1516. doi:10.1097/00000542-200306000-00035 . Griva, K., Newman, S.P., Hansraj, J., Hankins, M., Thompson, M., Davenport, D. … Harrison, M. (2003). Acute neuropsychological changes in hemodialdialysis and peritoneal dialysis patients. Health Psychology, 22(6), pp. 570–578. Steed, L., Cooke, D. and Newman, S.P. (2003). A systematic review of psychosocial outcomes following education, self-management and psychosocial interventions in diabetes mellitus. Patient Education and Counseling, 51, pp. 5–15. Stygall, J., Newman, S.P., Fitzgerald, G., Arrowsmith, J., Steed, L., Mulligan, K. … Harrison, M.J.G. (2003). Cognitive changes five years after coronary artery bypass surgery. Health Psychology, 22(6), pp. 579–586. Newman, S.P. (2003). The psychological perspective: a professional review. Heart, 89(Supp 11), pp. 16–18. Brown, C.T., O’Flynn, E., Van Der Meullen, J., Newman, S.P., Mundy, A.R. and Emberton, M. (2003). The fear of prostate cancer in men with lower urinary tract symptoms: should symptomatic men be screened? British Journal of Urology International, 91, pp. 30–32. Kong, R.S., Butterworth, J., Aveling, W., Stump, D.A., Harrison, M.J.G., Hammon, J. … Newman, S.P. (2002). Clinical trial of the neuroprotectant clomethiazole in coronary artery bypass graft surgery: a randomized controlled trial. Anesthesiology, 97(3), pp. 585–591. Newman, S.P. and Harrison, M.J.G. (2002). Coronary-artery bypass surgery and the brain: persisting concerns. Lancet Neurol, 1(2), pp. 119–125. Kong, R., Butterworth, J., Aveling, W., Stump, D.A., Harrison, M.J.G., Hammon, J. … Newman, S.P. (2002). Clinical trial of clomethiazole as a neuroprotectant in CABG. Anaesthesiology, 97(3), pp. 585–591. Ziegelmann, J.P., Griva, K., Hankins, M., Harrison, M., Davenport, A., Thompson, D. … Newman, S.P. (2002). The Transplant Effects Questionnaire (TxEQ): The development of a questionnaire for assessing the multidimensional outcome of organ transplantation – example of End Stage Renal Disease (ESRD). British Journal of Health Psychology, 7, pp. 393–408. Griva, K., Zieglmann, J., Thompson, D., Jayasena, D., Davenport, A., Harrison, M.J.G. … Newman, S.P. (2002). Quality of life and emotional responses in cadaver and living-related renal transplant recipients. Nephrology, Dialysis and Transplantation, 17, pp. 2204–2211. Frost, S., Myers, L.B. and Newman, S.P. (2002). Genetic screening for Alzheimer’s Disease: What factors predict intentions to take a test? Psychology, Health & Medicine, 27(3), pp. 101–109. Whitaker, D.C., Stygall, J. and Newman, S.P. (2002). Neuroprotection during cardiac surgery: Strategies to reduce cognitive decline. Perfusion, 17, pp. 69–75. Newman, S.P. and Harrison, M.J.G. (2002). Cardiac surgery and the brain: Persisting concerns. The Lancet Neurology, 1, pp. 198–125. Amponsa-Afuwape, S.A., Myers, L.B. and Newman, S.P. (2002). Cognitive predictors of ethnic minorities’ blood donation intention. Psychology, Health and Medicine, 7(3), pp. 357–361. Newman, S.P. and Mulligan, K. (2002). Psycho-educational interventions in rheumatic disease: A review of papers published. Current Opinions in Rheumatology, 15, pp. 156–159. Newman, S.P. (2002). Satisfaction with respite care: A pilot study. Health & Social Care in the Community, 10(6), pp. 479–484. Harrington, J., Noble, L. and Newman, S.P. (2001). What do patients expect of psychiatric services? A systematic and critical review of empirical studies. Social Science and Medicine, 52, pp. 985–998. Newman, S.P., Mulligan, K. and Steed, E. (2001). What is meant by self-management and how can its efficacy be established? Rheumatology, 40, pp. 1–6. Whitaker, D.C., Stygall, J.A., Newman, S.P. and Harrison, M.J.G. (2001). The use of arterial line filters in cardiac surgery: A systematic review of clinical studies. Perfusion, 16, pp. 433–446. Pincus, T. and Newman, S.P. (2001). Recall bias, pain, depression and cost in back pain patients. British Journal of Clinical Psychology, 40, pp. 143–156. Cooke, D.D., McNally, L., Mulligan, K.T., Harrison, M.J.G. and Newman, S.P. (2001). Psychosocial interventions for caregivers of people with dementia: A systematic review. Ageing & Mental Health, 5(2), pp. 120–135. Steed, L., Kong, R., Stygall, J., Acharya, J., Bolla, M., Harrison, M.J.G. … Newman, S.P. (2001). Role of Apolipoprotein E in cognitive decline after cardiac operation. The Annals of Thoracic Surgery, 71, pp. 823–826. Whitaker, D.C., Stygall, J.A., Newman, S.P. and Harrison, M.J.G. (2001). The use of leucocyte-depleting and conventional arterial line filters in cardiac surgery: a systematic review of clinical studies. PERFUSION-UK, 16(6), pp. 433–446. doi:10.1177/026765910101600602 . Taylor, J.C., Sterkel, B., Utley, M., Shipley, M.E., Newman, S., Horton, M. … Fitz-Clarence, H. (2000). Opinions and beliefs relating to osteoporosis among primary care physicians in the UK. JOURNAL OF BONE AND MINERAL RESEARCH, 15. Taylor, J.C., Sterkel, B., Utley, M., Shipley, M.E., Newman, S., Horton, M. … FitzClarence, H. (2000). Sources of information regarding osteoporosis used by primary care physicians in the UK. JOURNAL OF BONE AND MINERAL RESEARCH, 15. Taylor, J.C., Sterkel, B., Utley, M., Shipley, M.E., Newman, S., Horton, M. … Fitz-Clarence, H. (2000). Osteoporosis education received by general practitioners. JOURNAL OF BONE AND MINERAL RESEARCH, 15(6), pp. 1237–1237. Madland, G., Feinmann, C. and Newman, S.P. (2000). Factors associated with anxiety and depression in facial arthromyalgia. Pain, 84, pp. 225–232. Crawley, F., Stygall, J., Lunn, S., Harrison, M.J.G., Brown, M.M. and Newman, S.P. (2000). A comparison of micro-emboli detected by transcranial doppler and neuropsychological sequalae of carotid surgery and percutaneous transluminal angioplasty. Stroke, 31, pp. 1329–2334. James, P.R., Taggart, P., McNally, S.T., Newman, S.P., Sporton, S.C. and Hardman, S.M.C. (2000). Acute psychological stress and the propensity of ventricular arrhythmias: Evidence for a linking mechanism. European Heart Journal, 21, pp. 1023–1028. Newman, S.P. (2000). Cerebral microembolism detected by transcranial doppler during cardiac procedures. Stroke, 31, pp. 2508–2510. Griva, K., Myers, L. and Newman, S.P. (2000). Illness perceptions and self-efficacy beliefs in adolescents and young adults with Insulin dependent diabetes mellitus. Psychology and Health, 15(6), pp. 733–750. Pincus, T., Vogel, S., Savage, R. and Newman, S.P. (2000). Patients' satisfaction with osteopathic and GP management of low back pain in the same surgery. Complimentary Therapies in Medicine, 8, pp. 180–185. Newman, S.P. and Michie, S. (2000). Methods and models in health psychology. Psychology Health, 15(2). Steed, L., Newman, S.P. and Hardman, S.M.C. (1999). An examination of the self-regulation model in atrial fibrillation. British Journal of Health Psychology, 4(4), pp. 337–347. doi:10.1348/135910799168687 . Menon, S., Jameson-Shortall, E., Newman, S.P., Hall-Craggs, M.R., Chinn, R. and Isenberg, D.A. (1999). A longitudinal study of anticardiolipin antibody levels and cognitive functioning in systemic lupus erythematosus. Arthritis Rheum, 42(4), pp. 735–741. doi:10.1002/1529-0131(199904)42:43.0.CO;2-L .
Arrowsmith, J.E., Stygall, J., Timberlake, N., Pugsley, W.B., Harrison, M.J.G. and Newman, S.P. (1999). New depression following coronary artery bypass surgery. ANESTHESIA AND ANALGESIA, 88(4). Newman, S.P., Lunn, S., Crawley, F., Harrison, M.J.G. and Brown, M. (1999). The impact of carotid endarterectomy upon cognitive functioning: A systematic review of the literature. Cerebrovascular Diseases, 9, pp. 74–81. Menon, S., Jameson-Shortall, E., Newman, S.P., Hall-Craggs, M., Chinn, R. and Isenberg, D. (1999). A longitudinal study of anticardiolipin antibody levels and cognitive functioning in SLE. Arthritis and Rheumatism, 42. McNally, S., Ben-Shlomo, Y. and Newman, S.P. (1999). The effects of respite care on informal carers’ well-being: A systematic review. Disability and Rehabilitation, 12(1), pp. 1–14. McNally, S.T. and Newman, S.P. (1999). Objective and subjective conceptualisations of social support. Journal of Psychsomatic Research, 46(4), pp. 309–314. Newman, S.P. and Stygall, J. (1999). Cognitive changes following cardiac surgery. Heart, 82, pp. 541–542. Steed, L., Hardman, S. and Newman, S.P. (1999). An examination of the self-regulation model of arterial fibrillation. British Journal of Health Psychology, 4, pp. 735–741. Noble, L.M., Douglas, B.C. and Newman, S.P. (1999). What do patients want and do we want to know? A review of patients requests of psychiatric services. Acta Psychiatrica Scandanavia, 100, pp. 321–327. Douglas, B.C., Noble, L.M. and Newman, S.P. (1999). Improving the accuracy of patients’ expectations of the psychiatric outpatient consultation. Psychiatric Bulletin, 23, pp. 425–427. McNally, S., Ben-Shlomo, Y. and Newman, S. (1999). The effects of respite care on informal carers' well-being: a systematic review. Disabil Rehabil, 21(1), pp. 1–14. Newman, S.P. (1998). Neuropsychological dysfunction after minimally invasive direct coronary artery bypass grafting - Invited commentary. ANNALS OF THORACIC SURGERY, 66(5), pp. 1617–1617. Toner, I., Taylor, K., Lockwood, G., Newman, S.P. and Smith, P. (1998). Cerebral functional changes following cardiac surgery: Neuropsychological and EEG assessment. European Journal of Cardiothoracic Surgery, 13(1), pp. 13–20. Lunn, S., Williams, S., Weinman, J. and Newman, S.P. (1998). The effect of gender on doctor patient interaction. Psychology and Health, 13, pp. 975–986. Harrison, M.J.G., Newman, S.P. and et al, (1998). Evidence of CNS impairment in HIV infection - a clinical, neuropsychological, EEG and MRI/MRS study. Journal of Neurology, Neurosurgery and Psychiatry, 65, pp. 301–307. Arrowsmith, J.E., Harrison, M.J.G., Newman, S.P., Stygall, J., Timberlake, N. and Pugsley, W.B. (1998). Neuroprotection of the brain during cardiopulmonary bypass: A randomised trial of Remacemide during coronary artery bypass in 171 patients. Stroke, 20, pp. 2357–2362. Newman, S.P. (1998). Editorial: Changes in Cognition following cardiac surgery. Annals of Thoracic Surgery, 66(5), p. 1617. Newman, S.P. and Ventura-Filipe, E. (1998). Influence of an HIV positive status on sexual behaviour among males. Journal of Public Health (Brazil), 32(6), pp. 503–513. Butterworth, J., Kong, R., Aveling, W., Stump, D. and Newman, S. (1997). Clomethiazole used as a neuroprotective during coronary artery surgery: Pharmacokinetic and safety evaluations. ANESTHESIOLOGY, 87(3). doi:10.1097/00000542-199709001-00107 . Brooks, P., McFarlane, A.C., Newman, S. and Rasker, J.J. (1997). Psychosocial measures. JOURNAL OF RHEUMATOLOGY, 24(5), pp. 1008–1011. Chinn, R.S., Wilkinson, I.D., Hall-Craggs, M.A., Paley, M.N.J., Shortall, E., Carter, S. … Newman, S.P. (1997). Magnetic Resonance Imaging of the brain and cerebral proton spectroscopy in patients with systemic lupus erythematosus. Arthritis & Rheumatism, 40(1), pp. 36–46. Wilkinson, I., Miller, R., Mitzskiel, K., Paley, M., Hall-Craggs, M., Baldeweg, T. … Harrison, M. (1997). Cerebral proton magnetic resonance spectroscopy in asymptomatic HIV infection. AIDS, 11, pp. 289–295. Epstein, R., Stygall, J. and Newman, S.P. (1997). The Short-Term impact of Botox Injections on speech disability in adductor spasmodic dysphonia. Disability and Rehabilitation, 19(1), pp. 20–25. Newman, S.P. (1997). Psychosocial measures in musculoskeletal trials. Journal of Rheumatology, 24, pp. 979–984. Timberlake, N., Klinger, L., Smith, P., Venn, G., Treasure, T., Harrison, M. … Newman, S.P. (1997). Incidence and patterns of depression following coronary artery bypass graft surgery. Psychosomatic Research, 43(2), pp. 197–202. Wilkinson, I.D., Lunn, S., Miskie, K.A., Miller, R.F., Paley, M.N.J., Williams, I. … Harrison, M.J.G. (1997). Proton MRS and quantitative MRI assessment of the short-term neurological response to anti-retroviral therapy in AIDS. Journal of Neurology, Neurosurgery, and Psychiatry, 63, pp. 477–482. Allen, R., Newman, S.P. and Souhami, R.L. (1997). Anxiety and Depression in Adolescent Cancer: Findings in Patients and Parents at the Time of Diagnosis. European Journal of Cancer, 8, pp. 1250–1255. Newman, S.P. (1996). Psychological assessment in rheumatic diseases. Topical Reviews, ARC. Arrowsmith, J.E., Stygall, J., Timberlake, N., Shah, T., Newman, S.P., Harrison, M.J.G. … Pugsley, W.B. (1996). Double blind, placebo controlled study of the effects of remacemide HCL on neuropsychological deficits following coronary artery surgery. BRITISH JOURNAL OF ANAESTHESIA, 76. Wilkinson, I., Paley, M., Hall-Craggs, M., Chinn, R., Chong, W., Sweeney, B. … Harrison, M. (1996). Cerebral magnetic resonance relaxometry in HIV infection. Magnetic Resonance Imaging, 14(4), pp. 365–372. Wright, S., Newman, S.P. and Fields, H. (1996). Dyslexia: stability of definition over a 5 year period. Journal of Research in Reading, 19(1), pp. 46–59. Newman, S.P. and Stygall, J. (1996). Neuropsychological and psychological changes following cardiac surgery. Perfusion pp. 17–21. Williams, S., Weinman, J., Dale, J. and Newman, S.P. (1996). Expectations: A comparison between general practice patients with and without mood disorder. Primary Care Psychiatry, 2, pp. 229–235. Epstein, R., Stygall, J. and Newman, S.P. (1996). Anxiety associated with Botox injections for adductor spasmodic dysphonia. Logoped Phoniatr Vocol, 21, pp. 131–136. Stump, D.A., Rogers, A.T., Jammon, J.W. and Newman, S.P. (1996). Cerebral emboli and cognitive outcome after cardiac surgery. Journal of Cardiothoracic & Vascular Anaesthesia, 10(1), pp. 113–119. Chinn, R.J., Wilkinson, I.D., Hall-Craggs, M.A., Paley, M.N., Miller, R.F., Kendall, B.E. … Harrison, M.J. (1995). Toxoplasmosis and primary central nervous system lymphoma in HIV infection: diagnosis with MR spectroscopy. Radiology, 197(3), pp. 649–654. doi:10.1148/radiology.197.3.7480733 . NEWMAN, S.P., LUNN, S. and HARRISON, M.J.G. (1995). DO ASYMPTOMATIC HIV-SEROPOSITIVE INDIVIDUALS SHOW COGNITIVE DEFICIT. AIDS, 9(11), pp. 1211–1220. doi:10.1097/00002030-199511000-00001 . Newman, S.P. (1995). Analysis and interpretation of neuropsychological testing in cardiac surgery. Annals of Thoracic Surgery, 59, pp. 1351–1355. Murkin, J.M., Newman, S.P., Stump, D.A. and Blumenthal, J.A. (1995). Statement of consensus on assessment of neurobehavioural outcomes after cardiac surgery. Annals of Thoracic Surgery, 59, pp. 1289–1295. Connolly, S., Manji, H., McAllister, R.H., Griffin, G.B., Oveday, C., Kirkis, C. … Harrison, M.J.G. (1995). Neurophysiological assessment of peripheral nerve and spinal cord function in asymptomatic HIV-1 infection: results from the UCMSM/Medical Research Council neurology cohort. Journal of Neurology, 242, pp. 406–414. Williams, S., Weinman, J., Dale, J. and Newman, S.P. (1995). Patients’ expectations: What do primary care patients want from the GP and how far does meeting expectations affect patient satisfaction? Family Practice, 12(2), pp. 193–201. Newman, S.P., Lunn, S. and Harrison, M.J.G. (1995). Do asymptomatic HIV seropositive individuals show cognitive deficit - a review of cross sectional and longitudinal research Do asymptomatic HIV seropositive individuals show cognitive deficit - A review of 36 studies. AIDS, 9, pp. 1211–1220. Chinn, R., Wilkinson, I., Hall-Craggs, M., Paley, M., Miller, R., Kendall, B. … Harrison, M. (1995). Toxoplasmosis and primary CNS lymphoma in HIV Infection: Diagnosis by Magnetic Resonance Spectroscopy. Radiology, 197, pp. 649–654. Patel, R., Newman, S.P., James, D., Venn, G., Turtle, M. and Chambers, D. (1995). Alpha-Stat Acid-Base regulation during cardiopulmonary bypass improves neuropsychological outcome in patients undergoing coronary artery bypass grafting. The Journal of Thoracic and Cardiovascular Surgery, 111(6). STUMP, D.A., HART, S., RUBY, B.J., NEWMAN, S.P., COKER, L.H. and ROGERS, A.T. (1994). NEW NEUROPSYCHOLOGICAL, DEFICITS ONE MONTH FOLLOWING CABG. ANESTHESIA AND ANALGESIA, 78(2). CONNOLLY, S., MANJI, H., MCALLISTER, R.H., FELL, M., LOVEDAY, C., KIRKIS, C. … HARRISON, M.G. (1994). LONG-LATENCY EVENT-RELATED POTENTIALS IN ASYMPTOMATIC HUMAN-IMMUNODEFICIENCY-VIRUS TYPE-1 INFECTION. ANNALS OF NEUROLOGY, 35(2), pp. 189–196. doi:10.1002/ana.410350210 . Newman, S.P. (1994). Systemic Lupus Erythematosus - disease activity, severity, treatment and costs - Editorial. The Journal of Rheumatology, 21, pp. 394–396. Manji, H., McAllister, R., Fell, M., Connolly, S., Durrance, P., Newman, S.P. … Harrison, M. (1994). Serial Magnetic Resonance Imaging of the brain in asymptomatic HIV infected individuals - Results from the UCMSM/ Medical Research Council neurology cohort. Journal of Neurology Neurosurgery and Psychiatry, 57, pp. 144–149. Connolly, S., Manji, H., McAllister, R., Fell, M., Loveday, C., Kirkis, C. … Harrison, M. (1994). Long-latency event-related potentials in asymptomatic HIV-1 infection. Annals of Neurology, 35, pp. 189–196. Newman, S.P., Paley, M., Chong, W.K., Wilkinson, I.D., Shepherd, J.K., Clews, A.M. … Harrison, M.J.G. (1994). Cerebrospinal fluid - intercranial volume ratio measurement in patients with HIV infection: CLASS image analysis technique. Radiology, 190, pp. 879–886. Toner, I., Peden, C.J., Hamid, S.K., Newman, S.P., Taylor, K. and Smith, P.L.C. (1994). Magnetic resonance imaging (MRI) and neuropsychological changes following coronary artery bypass graft (CABG) surgery. Journal of Neurosurgical Anaesthesiology, 4, pp. 163–169. Pugsley, W., Klinger, L., Paschalis, C., Treasure, T., Harrison, M. and Newman, S.P. (1994). The impact of microemboli in cardiopulmonary bypass on neuropsychological functioning. Stroke, 25(7), pp. 1393–1399. Shortall, E., Isenberg, D. and Newman, S.P. (1994). Factors associated with mood and mood disorders in SLE. Lupus, 4, pp. 272–279. Manji, H., Connolly, S., McAllister, R., Valentine, A.R., Kendall, B.E., Fell, M. … Harrison, M.J.G. (1994). Serial MRI of the brain in asymptomatic patients infected with HIV: Results from the UCMSM/Medical research council neurology cohort. Journal of Neurology Neurosurgery and Psychiatry, 57(2), pp. 144–149. doi:10.1136/jnnp.57.2.144 . SHORTALL, E.P., ISENBERG, D.A. and NEWMAN, S.P. (1993). FACTORS ASSOCIATED WITH VARIATIONS IN MOOD AND PSYCHIATRIC-DISORDER IN SYSTEMIC LUPUS-ERYTHEMATOSUS. ARTHRITIS AND RHEUMATISM, 36(9). Bowman, S.J., Wedderburn, L., Whaley, A., Grahame, R. and Newman, S. (1993). Outcome assessment after epidural corticosteroid injection for low back pain and sciatica. Spine (Phila Pa 1976), 18(10), pp. 1345–1350. (1993). A developmental study of specific spelling disability. The British journal of educational psychology, 63. Newman, S.P., Wright, S. and Fields, H. (1993). A developmental study of specific spelling disability. British Journal of Educational Psychology, 63, pp. 287–296. Fell, M., Newman, S.P., Herns, M., Durrance, P., Manji, H., Connoly, M. … Harrison, M. (1993). Mood and psychiatric disturbance in HIV and AIDS: changes over time. British Journal of Psychiatry, 162, pp. 604–610. Newman, S.P., Durrance, P. and Fell, M. (1993). Counselling in HIV and AIDS. British Journal of Clinical Psychology, 32, pp. 117–119. Newman, S.P. (1993). Coping with rheumatoid arthritis. Annals of the Rheumatic Diseases, 52, pp. 553–554. Tone, I., Peden, C.J., Hamid, S.K., Newman, S.P., Taylor, K. and Smith, P.L.C. (1993). Magnetic resonance imaging and P300 (event-related auditory evoked potentials) in the assessment of postoperative cerebral injury following coronary artery bypass graft surgery. Perfusion, 8, pp. 321–329. Patel, R., Turtle, M., Chambers, D.J., Newman, S.P. and Venn, G. (1993). Hyperperfusion and cerebral dysfunction effects of differing acid-base management during cardiopulmonary bypass. European Journal of Cardiothoracic Surgery, 7, pp. 457–464. Chong, W.K., Sweeney, B., Wilkinson, I.D., Paley, M., Hall-Craggs, M., Kendall, B.E. … Harrison, M.J.G. (1993). Proton spectroscopy of the brain in HIV infection: Clinical, immunological and MRI correlations. Radiology, 188(1), pp. 119–124. Bowman, S., Wedderburn, L., Whaley, A., Grahame, R. and Newman, S.P. (1993). Outcome assessment after epidural corticosteroid injection for low back pain and sciatica. Spine, 18(10), pp. 1145–1350. Chong, W.K., Sweeney, B., Wilkinson, I.D., Paley, M., Hall-Craggs, M.A., Kendall, B.E. … Harrison, M.J.G. (1993). Proton spectroscopy of the brain in HIV infection: Correlation with clinical, immunologic, and MR imaging findings. Radiology, 188(1), pp. 119–124. doi:10.1148/radiology.188.1.8099750 . McAllister, R., Herns, M., Harrison, M., Newman, S.P. and et al, (1992). Neurological and neuropsychological performance in HIV seropositive men without symptoms. Journal of Neurology Neurosurgery and Psychiatry, 55, pp. 143–148. Griffin, S., Klinger, L., Newman, S.P., Hothersall, J., McLean, P., Harrison, M. … Treasure, T. (1992). The effects of substrate load and blood glucose management on cerebral dysfunction following cardiopulmonary bypass. Vascular surgery, 26, pp. 656–664. Newman, S., Wright, S. and Fields, H. (1991). Identification of a group of children with dyslexia by means of IQ-achievement discrepancies. The British journal of educational psychology, 61. Newman, S.P., Wright, S. and Fields, H. (1991). Identification of a group of children with dyslexia by means of IQ-achievement discrepancies. British Journal of Educational Psychology, 61, pp. 139–154. Fitzpatrick, R., Newman, S.P., Archer, R. and Shipley, M. (1991). Social support, disability and depression: A longitudinal study of rheumatoid arthritis. Social Science & Medicine, 35, pp. 605–611. Newman, S.P., Fitzpatrick, R., Lamb, R. and Shipley, M. (1990). Patterns of coping in rheumatoid arthritis. Psychology & Health, 4, pp. 187–200. Newman, S.P., Lamb, R., Fitzpatrick, R. and Shipley, M. (1990). Identifying coping strategies in rheumatoid arthritis - A cluster analytic approach. Health Psychology Section, Occasional Papers, 2, pp. 17–19. Pugsley, W., Treasure, T., Klinger, L., Newman, S.P., Pascalis, C. and Harrison, M. (1990). Microemboli and cerebral impairment during cardiac surgery. Vascular Surgery, 24, pp. 34–43. Fitzpatrick, R., Newman, S.P., Lamb, R. and Shipley, M. (1990). Helplessness and control in rheumatoid arthritis. International Journal of Health Sciences, 1, pp. 17–23. Harrison, M.J.G., Pugsley, W., Newman, S.P., Paschalis, C., Klinger, L., Treasure, T. … Aspey, B. (1990). Detection of middle cerebral emboli during coronary artery bypass surgery using transcranial doppler sonography. Stroke, 21, pp. 415–423. Bowman, S.J., Brostoff, J., Newman, S. and Mowbray, J.F. (1989). Postviral syndrome--how can a diagnosis be made? A study of patients undergoing a Monospot test. J R Soc Med, 82(12), pp. 712–716. Carne, C.A., Stibe, C., Bronkhurst, A., Newman, S.P., Weller, I.V., Kendall, B.E. … Harrison, M.J. (1989). Subclinical neurological and neuropsychological effect of infection with HIV. Genitourin Med, 65(3), pp. 151–156. Blauth, C., Smith, P., Newman, S.P., Arnold, J., Siddons, F., Harrison, M. … Taylor, K. (1989). Retinal microembolisation and neuropsychological deficit following clinical cardiopulmonary bypass: comparison of a membrane and a bubble oxygenator. European Journal of Cardiothoracic Surgery, 3, pp. 135–139. Tan, P., Aveling, W., Pugsley, W., Newman, S.P. and Treasure, T. (1989). Experience with circulatory arrest and hypothermia to facilitate thoracic aortic surgery. Annals of the Royal College of Surgeons, 71, pp. 81–86. Newman, S.P. (1989). The incidence and nature of neuropsychological morbidity following cardiac surgery. Perfusion, 4, pp. 93–100. Harrison, M., Schneidau, A., Ho, R., Smith, P., Newman, S.P. and Treasure, T. (1989). Cerebrovascular disease and functional outcome after coronary artery bypass surgery. Stroke, 20, pp. 235–237. Treasure, T., Smith, P., Newman, S.P., Schneidau, A., Joseph, P., Ell, P. … Harrison, M. (1989). Impairment of cerebral function following cardiac and other major surgery. European Journal of Cardiothoracic Surgery, 3, pp. 216–221. Newman, S.P., Klinger, L., Venn, G., Smith, P., Harrison, M. and Treasure, T. (1989). Subjective reports of cognition in relation to assessed cognitive performance following coronary artery bypass surgery. Journal of Psychosomatic Research, 33, pp. 227–233. Fitzpatrick, R., Newman, S.P., Newman, S., Lamb, R. and Shipley, M. (1989). A comparison of measures of outcome in rheumatoid arthritis. British Journal of Rheumatology, 28, pp. 201–203. Newman, S.P., Pugsley, W., Klinger, L., Aveling, W., Harrison, M. and Treasure, T. (1989). The neuropsychological consequences of circulatory arrest with hypothermia - a case report. Journal of Clinical & Experimental Neuropsychology, 11, pp. 529–538. Newman, S.P., Wright, S. and Fields, H. (1989). Identifying subgroups of reading and spelling disorders by discrepancy scores. Irish Journal of Psychology, 11, pp. 529–538. Wright, S., Newman, S.P. and Fields, H. (1989). The use of rhyme and orthography in a cued recall task: A comparison of different age and ability groups. Irish Journal of Psychology, 10, pp. 593–600. Newman, S.P. and Klinger, L. (1989). Intellectual changes following coronary artery bypass grafting: current trends in research. Spectrum, 30. Fields, H., Newman, S.P. and Wright, S. (1989). Techniques for identifying a group with spelling difficulties in the absence of reading difficulties. Irish Journal of Psychology, 10, pp. 472–478. Carne, C., Stibe, C., Bronkhurst, A., Newman, S.P., Weller, I., Kendall, B. … Harrison, M. (1989). Subclinical neurological and neuropsychological involvement in HIV infection. Genitourinary Medicine, 65, pp. 151–156. Bowman, S., Brostoff, J., Newman, S.P. and Mowbray, J. (1989). Are there predictors of recovery after a monospot test ? How do we diagnose post-viral syndrome? Journal of the Royal Society of Medicine, 82, pp. 712–716. Newman, S.P., Fitzpatrick, R., Lamb, R. and Shipley, M. (1989). The origins of depressed mood in rheumatoid arthritis. Journal of Rheumatology, 16, pp. 740–744. Newman, S. and Fields, H. (1989). Identifying Subtypes of Reading and Spelling Disorders, by Discrepancy Scores. The Irish Journal of Psychology, 10(4), pp. 647–656. doi:10.1080/03033910.1989.10557779 . Venn, G., Sherry, K., Treasure, T., Newman, S.P., Harrison, M., Klinger, L. … Ell, P. (1988). Cerebral blood flow during cardiopulmonary bypass. European Journal of Cardiothoracic Surgery, 2, pp. 360–363. Fitzpatrick, R., Newman, S.P., Lamb, R. and Shipley, M. (1988). Social relationships and psychological well being in rheumatoid arthritis. Social Science and Medicine, 27, pp. 399–403. Swinnburn, C., Wakefield, J., Newman, S.P. and Jones, P. (1988). Evidence of Prednisolone induced mood change ('steroid euphoria') in patients with chronic obstructive airways disease. British Journal of Clinical Pharmacology, 26, pp. 709–713. Venn, G., Sherry, K., Treasure, T., Newman, S.P., Harrison, M., Klinger, L. … Ell, P. (1988). Clinical implications of cerebral blood flow changes during cardiopulmonary bypass. Perfusion, 3, pp. 271–280. Newman, S.P., Fields, H., Redburn, J., Lamb, R. and Karle, H. (1988). Ocular dominance and oculomotor tracking in dyslexia. Bull Audiophonol, 4, pp. 465–476. Venn, G.E., Sherry, K., Klinger, L., Newman, S., Treasure, T., Harrison, M. … Ell, P.J. (1988). Cerebral blood flow during cardiopulmonary bypass. European Journal of Cardio-Thoracic Surgery, 2(5), pp. 355–359. doi:10.1016/1010-7940(88)90012-7 . Venn, G.E., Sherry, K., Klinger, L., Newman, S., Harrison, M., Ell, P.J. … Treasure, T. (1988). Cerebral blood flow determinants and their clinical implications during cardiopulmonary bypass. Perfusion, 3(4), pp. 271–280. doi:10.1177/026765918800300404 . Newman, S.P. (1987). Acute neuropsychological consequences of coronary artery bypass surgery. Current Psychological Research & Reviews, 6, pp. 115–124. Mikhailidis, D.P., Barradas, M.A., Dandona, P., Treasure, T., Smith, P., Newman, S. … Taggart, D.P. (1986). CEREBRAL CONSEQUENCES OF CARDIOPULMONARY BYPASS. The Lancet, 328(8498), p. 99. doi:10.1016/S0140-6736(86)91625-9 . Smith, P., Treasure, T., Newman, S.P., Joseph, P., Ell, P. and Harrison, M. (1986). Cerebral consequences of cardiopulmonary bypass. The Lancet, 1, pp. 823–825. Newman, S.P., Lamb, R. and Civil, M. (1986). Eye movements and sequential tracking: The effect of reading experience. Perceptual & Motor Skills, 63, pp. 431–434. Treasure, T., Harrison, M., Newman, S. and Smith, P. (1986). Neurological complications of coronary artery bypass surgery. British Medical Journal (Clinical research ed. ), 293(6547), p. 625. doi:10.1136/bmj.293.6547.625 . Newman, S.P., Wadsworth, J., Archer, R., Karle, H. and Hockly, R. (1985). Eye dominance & reading - A re-assessment of a measure used to assess specific reading difficulties. Journal of Reading Research, 8, pp. 127–138. Newman, S.P., Wadsworth, J., Archer, R. and Hockley, R. (1985). Ocular dominance, reading & spelling ability in schoolchildren. British Journal of Ophthalmology, 69, pp. 228–232. Newman, S.P., Karle, H., Wadsworth, J.F., Archer, R., Hockly, R. and Rogers, P. (1985). Ocular dominance, reading and spelling: a reassessment of a measure associated with specific reading difficulties. Journal of Research in Reading, 8(2), pp. 127–138. doi:10.1111/j.1467-9817.1985.tb00313.x . Newman, S.P. (1984). The social and emotional consequences of stroke and head injury. International Review of Applied Psychology, 33, pp. 427–455. Newman, S.P. and Albino, R. (1979). Hemisphere Specialisation & Judgements of Simultaneity of Brief Light Flashes. Perceptual and Motor Skills, 49, pp. 943–956. Green, D. and Newman, S.P. (1979). The bilingual brain. Polyglot, 2(1). Newman, S.P. and Albino, R. (1977). Temporal Order Perception of Two Physically Simultaneous Light Flashes. Journal of Behavioural Science, 2, pp. 203–209. MacKenzie, K., Au, C., James, H., Hancox, J., Azra, D., Adams, G. … Newman, S. The Psychological Status of Adults with Strabismus Seeking Surgery. Appearance Matters 5, Bristol, 2012. James, H., Au, C., Mackenzie, K., Hancox, J., Ezra, D., Adams, G. … Newman, S. The Psychological Status of Adults with Strabismus Seeking Surgery. American Association for Pediatric Ophthalmology and Strabismus Annual Meeting, San Antonio, USA., 2012. James, H., Au, C., Mackenzie, K., Hancox, J., Ezra, D., Adams, G. … Newman, S. The Psychological Status of Adults with Strabismus Seeking Surgery. The Royal College of Ophthalmologists Annual Congress, Liverpool, 2012. Newman, S.P. (1980). BBC Dubbing Research Project..
Newman, S.P. (1979). BBC Dubbing Research Project..
Health Psychology Reviews, Editorial Board. Kings Fund International Congress on Telehealth and Telecare Plenary. (2013). Evaluation of a web-based information and advice tool for parents of children with newly diagnosed JIA. (2013). Masterclass Programme. Utrecht, Netherlands (2013). Pulse Round table discussion. (2012). 3 million lives with Royal College of General Practitioners (RCGP): roundtable seminar. (2012). 3 Million Lives: Roundtable seminar. (2012). The future of telehealth and telecare. (2012). Description: The Conservative Policy Forum. CPF Public Services and Infrastructure Sectoral Group. Driving adoption through robust evidence generation. (2012). Description: M Health Webinar. Panel discussion and live web broadcast. Sponsored by GSMA mHealth. Evidence for and Against Telecare as reflected in WSD Research. (2013). HaCIRIC International Conference. Keynote speaker. Track: Outcomes and Evidence. (2013). International Meeting and Exposition of the American Telemedicine. Keynote speaker on Panel Presentation. Panel Title: The UK's Whole System Demonstrators Program: Lessons From the World's Largest Trial of Remote Care. Service Transformation by Telemedicine. Lessons to Learn from the Whole System Demonstrator - The clinical evidence. (2012). Danish Society for Clinical Telemedicine. Key note speaker. The Whole System Demonstrator RCT Evaluation of Telehealth. Copenhagen (2012). E-Health Observatorys Annual Meeting. Keynote speaker. Learning from the pilots and promoting the dissemination of innovation. (2012). Westminster Health Forum - Telehealth and Telecare - Keynote speaker. Enabling Independent Living though advancing Universal Design of Health Services for Telecare and Telehealth. (2012). Irish National Seminar on Telehealth/Telecare. Keynote speaker.